The Eyes Have It. Ch 6. Adoptions At Last! Of the six Clementine-kittens only one has been adopted. 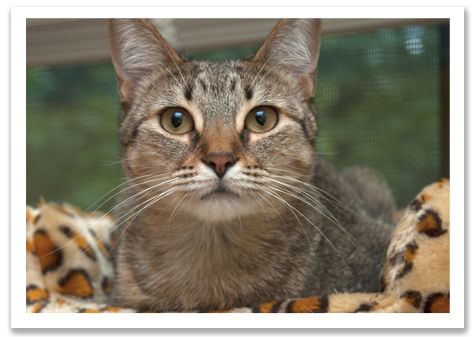 Marigold found her forever family while her brothers and sisters continued to wait. The Clems had been with me for over SIX MONTHS when Mari left us. The delay was mostly due to a reoccurring eye infection/upper respiratory tract infection. Though not seriously ill, I couldn’t let them be adopted until I had a better understanding on whether or not this was going to be a chronic condition. It wasn’t fair to adopters. The reason Mari got adopted was that she had been one of the most healthy of the litter and I’d just started a new treatment that we thought would resolve her issues. She seemed to do well so I believed I could move on with adopting out the others, but I was wrong. Buttercup got the eye infection again and Bert looked like he was getting it back, too. ©2014 Robin A.F. Olson. Vampire Buttercup! 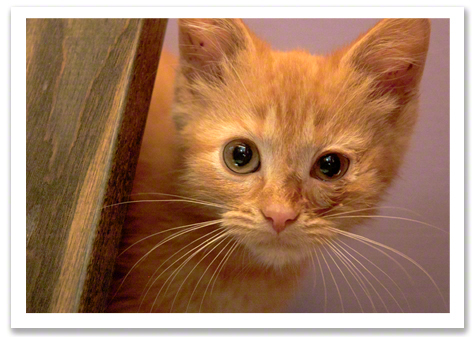 In March, one of our vets suggested we test the kittens for Bartonella. I almost slapped myself in the head when he said that. Of all the treatments and tests we’d never done that one and it made PERFECT sense. Bartonella is transmitted by fleas and the Clems were COVERED with them when we got them off transport. 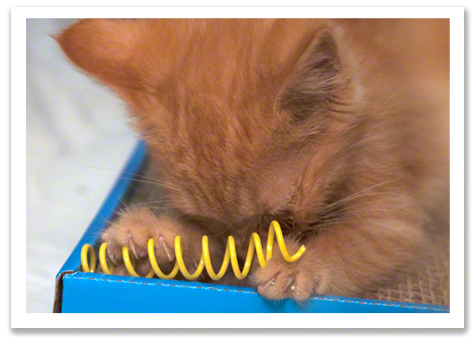 No wonder the kittens were never 100% well—especially Bert, who early on got hit the worst. I chose to test Bert for that reason and wasn’t surprised at the result. ©2014 Robin A.F. Olson. Rock Star Pose with Mandy (left), Blossom (center), Mango (right). A week later the results came in. Bert was a STRONG positive for bartonella. This was great news because it’s treatable, but the bad news was for Buttercup and Blossom, who were on the cusp of being adopted by Ellen and her family. Sadly Ellen has to be extremely careful about her health and after a long talk with her Doctor and Vet they decided it would be safer for the kittens to get their treatment here, THEN finalize the adoption. ©2014 Robin A.F. Olson. Silly Mandy with her “Precious” toy. She is obsessed with it. I could not argue that point, in fact, I wanted them to stay with me. Why have the first few weeks of an adoption include their new mom having to medicate them for 3 weeks? Also, bartonella, also called Cat Scratch Fever, IS contagious to humans and from what I’ve heard from a Vet that caught it, it’s a very painful infection. The medication cost $235.00 for the 6 Clems and Biscotti, who I decided to treat at the advice of our Vet. I almost fell over at the cost. This litter of kittens was one of the most expensive to care for to date. Some times it amazes me just how expensive it is to care for a few kittens. It can really add up fast when they get sick. The risk of making the adopters wait was that the adopter could give up on doing the adoption and the girls would lose their home. There was nothing I could do expect hope for the best and that the family would still want the “kittens” now that their kittenhood is long past them. The “kittens” are huge, too, eating me out of house and home. I have to feed them at least 10, 5 oz cans of food a DAY. I can barely keep up with demand. I’m used to feeding a few little kittens, not the equivalent of 6 more adults who are pushing 8 pounds each (their brothers will be 9 pounds any second now). I really needed to get these cats placed before I ran out of money to care for them. ©2014 Robin A.F. Olson. Mandy and the faux-sniff. Ellen and I volleyed emails and photos, making sure our connection wasn’t lost. She watched SqueeTV , our webcam, with her boys all the time so she could keep up on how the kittens were doing. I could tell she was anxious to get the girls and was willing to wait the extra time to be able to finalize the adoption. I was very relieved. ©2014 Robin A.F. Olson. Biscotti, always in the background with Blossom and Mango. Finally on April 6th, Sam and I drove the girls to their new home, which is a block away from Long Island Sound. It was one of the first really sunny spring days so it was a very enjoyable drive to Westport, CT. The girls were a bit fussy in the car, but surprisingly Blossom got out of her carrier and sat in my lap, purring, watching the traffic go by. Buttercup was a bit more reserved but the trip wasn’t very long, so I don’t think she was too stressed. ©2014 Robin A.F. Olson. Mandy and Buttercup. After over a month wait, the girls got to meet their new family. Ellen was making sure everything was set in the kitchen where the girls would start off their new life. We took away a few items that might cause problems, then let the girls out. Blossom fared better, but both girls were very scared. The room was big and bright with lots of windows for bird watching. I knew they would be happy, but I knew it would take time. ©2014 Robin A.F. Olson. Blossom, Buttercup and you-know-who watch Mango fly. As we filled out the paperwork the girls began to explore a little bit. We gave them a snack and they both ate, which was a good sign. The neighbor’s cat, who looked like their dad, walked past the front window but the girls didn’t notice. I warned the family that the girls might flip out if they saw the cat again and that they could start peeing in the kitchen. I silently prayed there’d be no problems. The girls were very easy going and sweet. I hoped they’d get a kick out of seeing another cat. ©2014 Robin A.F. Olson. NOT photoshopped! 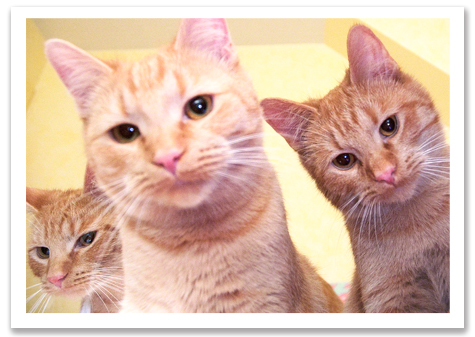 Mandy (left), Blossom (center), Mango (right), Biscotti pose for the camera (for once!). Once we got everything settled I gave the girls a kiss goodbye. It wasn’t a sad parting because I knew Ellen would make sure they got everything they needed and that her husband and sons would help her give them a great life. It wasn’t because I didn’t love them, because I did, but in truth they should have been adopted months ago and now we have more kittens in our program who need our help. ©2014 Ellen Gleicher. Used with Permission. The girls together in their new home. I’m glad the girls get to stay together, because I always prefer litters to be split into pairs if possible. 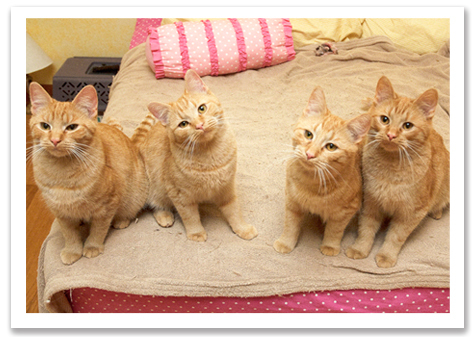 Now I had 3 kittens left from this family: Mango, Bert and Mandy. 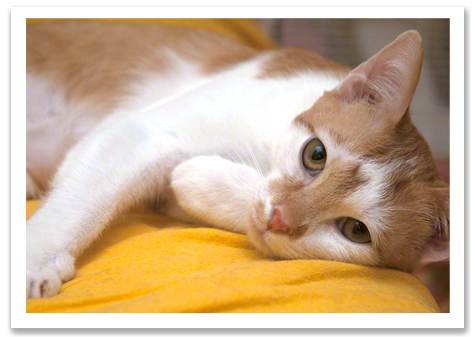 But what of Biscotti, the shy kitty who always got overlooked? 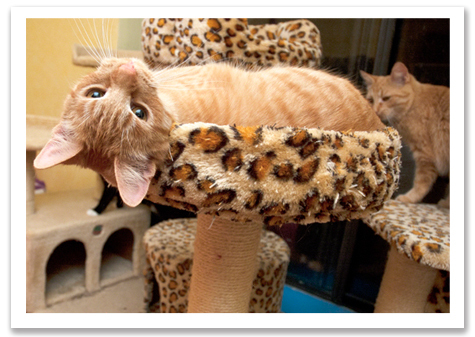 He’d moved in with the Clementines after his surrogate mom, Mocha, and her kittens were all adopted. I worried that Biscotti, who hides and seems to be completely mortified when new people arrive, would never find his place. The Clems are outgoing, fearless. I will find them homes, but I had my doubts about what was in store for the little tuxedo until a few days when I got a fateful call. 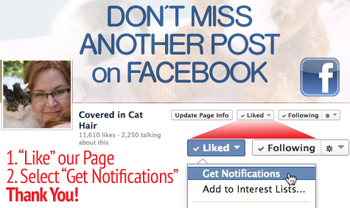 Visit our FACEBOOK PAGE HERE to LIKE our page and Change your settings now! Read more about The Eyes Have It. Ch 6. Adoptions At Last! The Accidental Feral. Big Daddy. Northern Georgia’s had a rough winter. With snow, ice and freezing cold temperatures that vastly skew from what’s considered normal, the feral cat population has had an even tougher time surviving. These cats are not accustomed to the colder temps and may not be as successful as their northern counterparts in finding adequate shelter. Their coats may not be as thick and their struggle to have a full belly leaves them even more vulnerable. For a lucky few cats there’s Warren and his wife, Terri, who I’ve written about in the past. 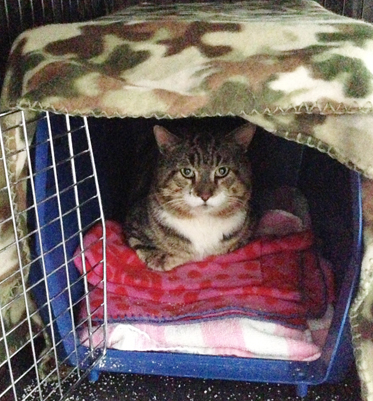 They get out there and trap, neuter, and some times return the feral cats they trap. They help the pregnant cats and the kittens find homes. They are very passionate about their rescues and have even hoped to open their own sanctuary one day. ©2014 Warren Royal. Used with permission. Big Daddy the day after being trapped. It’s not unusual for Warren to stay up late at night, watching a trap, hoping the cat will enter it so he can get it properly taken care of. Most of the time the process is straightforward. The cats are vetted, spayed or neutered, given some time to recover, then he brings them back to their colony where he and his wife will make sure they get fed. That’s why when Warren noticed a big tabby, limping, clearly injured, who also looked a heck of a lot like one of the kittens Warren rescued (read about Dexter’s amazing and scary journey HERE), he knew he had to trap him and get him to a vet. 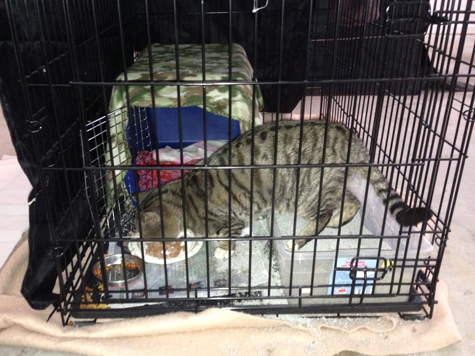 The problem was, what could he do for this kitty, AFTER getting vetted? Surely it would be difficult to treat a fractious cat, which could mean Warren could get hurt or the cat might not recover from his injury if he couldn’t get him medicated or change bandages. 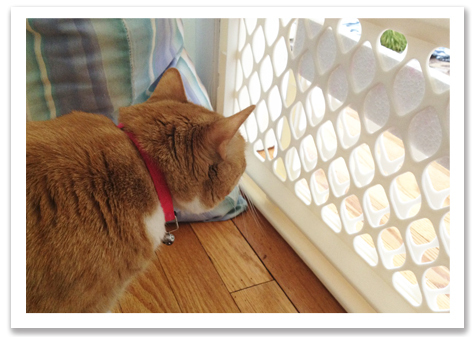 First things first…get the cat trapped. Warren got his supplies ready and opened up the trap. He saw the cat who he called, Big Daddy, not far away, watching him. As soon as Warren opened a can of food, in a flash, there was Big Daddy by his side, pushing Warren away so he could get at the tempting morsels. Shocked, Warren carefully, lured the cat into the trap, fearful he could be harmed at any moment if the cat was separated from his food for too long. Clearly the cat was starving and didn’t care if he was in a cage or not. ©2014 Warren Royal. Used with permission. Getting fueled up (again!). Warren quietly closed the trap door and rushed Big Daddy to the Vet. Big Daddy wasn’t thrilled to be in the car but there was something odd about him. For a feral cat, he wasn’t crouched into a tight ball. He wasn’t hissing. He wasn’t struggling to break free from the trap. He was just eating. They went ahead an ear-tipped him even though Warren said not to because he wasn’t sure the cat might not be feral. When we found that out we were both very angry. If Big Daddy ended up being a cat we could socialize, then ear-tipping him could further reduce his chances for adoption. ©2014 Warren Royal. Used with permission. What a face! They neutered him and vaccinated him. 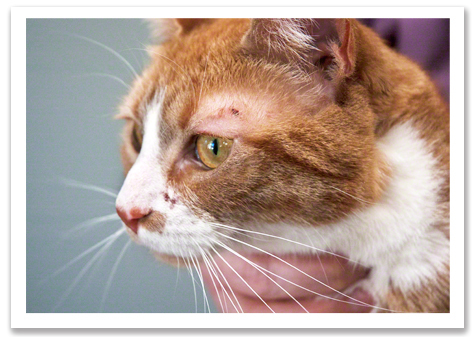 They snap tested him and discovered he was positive for Feline Immunodeficiency Virus or FIV. We weren’t surprised, but it meant that letting him back outside was not an option, but now what would we do with him? Warren feared he might have to euthanize the cat if he couldn’t go back to the colony or if he was too fractious to find a forever home. Warren came home and discovered his hunch was right. Big Daddy wasn’t feral, but how friendly was he? Did he have behavior problems? If so, how severe were they? 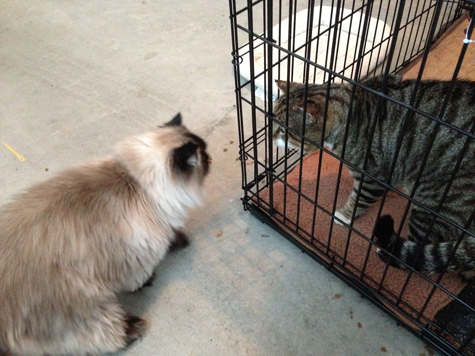 When Warren approached Big D’s crate, Big Daddy stepped forward and seemed interested in sniffing Warren’s hand. Worried he would get bitten, Warren cautiously offered the back of his hand. Big Daddy head-butted it. ©2014 Warren Royal. Used with permission. Waiting for the next part of his journey to begin. Warren slowly petted the cat. He seemed to like it and immediately began to purr. This poor cat, who Warren knew had to have been outside for a year or more, hadn’t forgotten the love he’d known from humans. He was willing to trust again, right away, which surprised us all. ©2014 Warren Royal. Used with permission. Over the past few weeks, Warren and Terri have been working with Big Daddy, assessing his behavior to see if he’d qualify to be adopted. Big D nipped at Warren a few times, but Terri said he never nipped her. Why? Turns out Warren needed to learn that Big Daddy didn’t care for being petted like he was a dog—oops! (Warren admitted to not realizing that right away since he’d known dogs most of his life). Once Warren made a slight change in how he petted Big D the nipping stopped. ©2014 Warren Royal. Used with permission. Loves that brush. Big Daddy’s met a few other cats. He’s interested, but neutral. A further test revealed another surprise-Big Daddy LOVES to be brushed! Big D’s leg is healing nicely and he’s relatively content in his big crate in the garage, but yearns to be out of it and in Warren’s house. 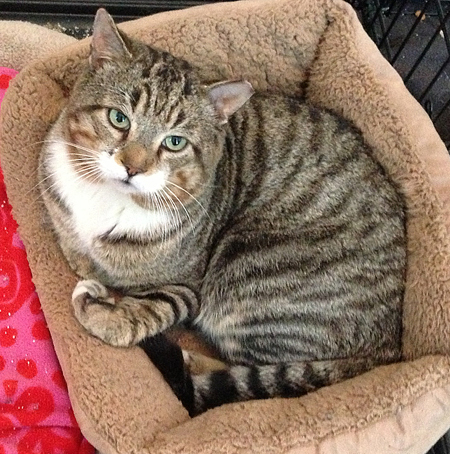 Sadly, Warren’s other cats won’t welcome a newcomer and ultimately Big Daddy needs a home of his own. 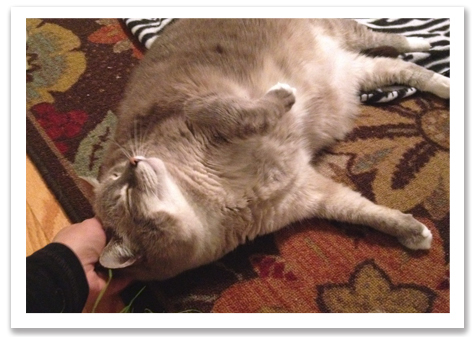 This very sweet, affectionate, gentle giant weighs 15 pounds and is about 4 years old. He's physically he’s a large kitty. Aside from having FIV, his health is good. 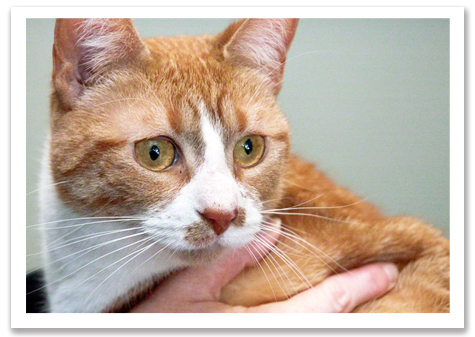 He does not have issues with his gums, teeth or digestion, which can happen to FIV cats. With a GOOD DIET and I mean NO DRY FOOD, low carb, grain-free canned food or better yet, dehydrated raw or really any raw diet, he will do well. 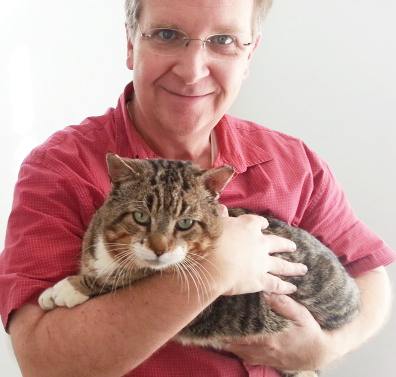 There are Vets who vilify cats with FIV and say they can’t be with non-FIV cats, but in my own experience with my cat, Bob, he was with not only my 7 cats, but countless kittens and none of them ever got sick. Bob would have had to BITE them so seriously his teeth would have had to sink into flesh to transmit the disease. Yet, there is a vet who just said she felt it was passed through a litter pan, which defies logic. ©2014 Warren Royal. Used with permission. Meeting Murphy. The bottom line is Big Daddy is no feral cat. 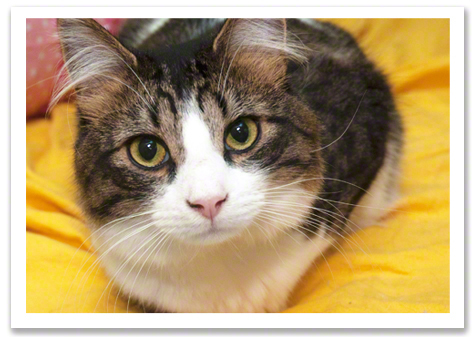 He's a big, sweet, super-cute, kitty who just wants to give and get love—who can be a friend to other cats. 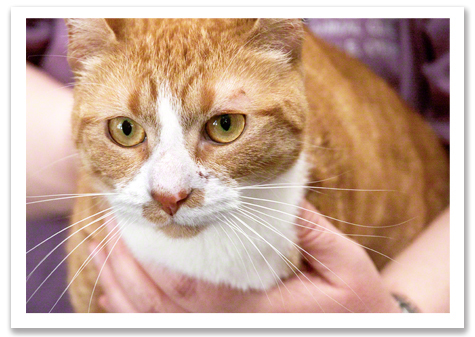 He's a cat who got dealt a tough hand now that he has FIV, but that doesn't mean he can't have a forever home. 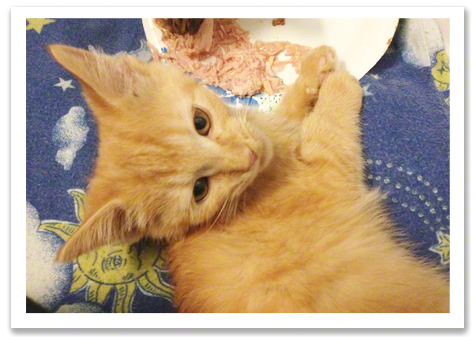 This accidental feral needs a forever home and we’re hoping that maybe it’s yours. ©2014 Warren Royal. Used with permission. What a cutie pie! Warren definitely has Big Daddy’s back. Because he cares for him so much Warren will cover transportation costs to an approved home or non-profit, no-kill rescue group or shelter. He will also TAKE BIG DADDY BACK, should the adoption or rescue placement not work out. Ideally this home will be in northern Georgia, but if it’s anywhere along the east coast of the USA, we can get Big Daddy to your door. If you live outside the east coast, let’s talk. ©2014 Warren Royal. Used with permission. Big Daddy with our Rescuer-Daddy, Warren. If you’re a non-profit, no kill rescue and would like to take Big Daddy on and find him a forever home, Big Daddy will come with a $250.00 sponsorship and he’s already completely vetted. If you’d like to adopt Big Daddy, go to our rescue group, Kitten Associates, and fill out a Pre Adoption Application and I will forward them to Warren. If you have any questions or are with a rescue and can help Big Daddy find his home, just email me at info@kittenassociates.org. 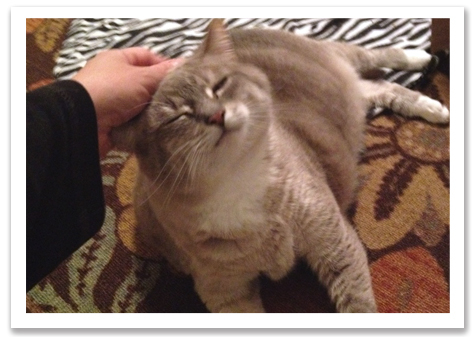 Please share this socially if you believe, as I do, that Big Daddy deserves a great home. Thank you! Read more about The Accidental Feral. Big Daddy. I sat in my car, in the dark, cold night and started up the engine. It rumbled to life as I grabbed the gear shift and slowly put the car into reverse. Shifting into first gear, I eased the car down the steep driveway of Susan and Barry's home. I'd just left Minnie in their bedroom and my mind was in playback mode, going over the last few hours and imagining what would yet come to pass. I was fit to be tied. Minnie is the mom to our most miraculous, stunning, kittens, Lil' Gracey, Confetti Joe, Jellybean Mel, Yukon Stan and Precious Pete. 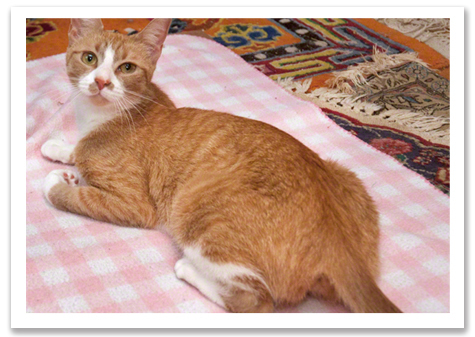 Minnie, who'd starved on the streets in Bridgeport, CT, then given birth, then got such a bad infection she almost died, had struggled enough in her short life. My only goals for her once in my care were to fatten her up and get her a wonderful home as she recovered from her difficult life. As most of her kittens found their forever homes, Minnie found a new foster home right down the street from my house. I was thrilled to let Minnie go because it meant she'd have more space to live and the love of a family and their two children, one of whom, a young girl, had a gentle and affectionate regard for Minnie right away. ©2014 Robin A.F. Olson. Minnie. 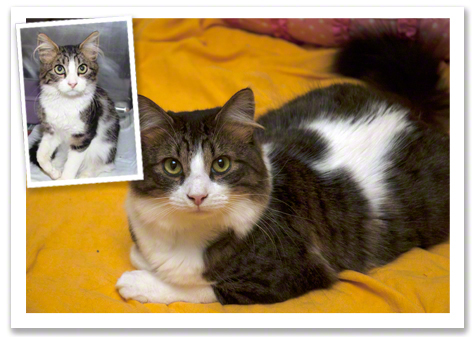 While Minnie passed the days in her foster home, I searched for her forever family. Months passed. I checked in on Minnie once in awhile, but didn't worry about anything, figuring if there was a problem, I'd find out. At first it was little things, like I'd heard Minnie had some fights with one of the family's two cats, but they seemed to be working it out. Minnie had long tired of the small bathroom that was her initial home, so she was allowed full run of the house. Since she was going to be there, potentially, a long time I thought it was fine. Last week I got an email saying Minnie had a cut over her eye that didn't seem to be healing. I went over and took a look, brought some calendula cream (a plant-based antibiotic cream) and treated her. I assumed she'd been scratched. Clearly she was not the aggressor. Minnie was also behaving fearfully. I assumed, again, it was due to the cats, but I also knew that the 12 yr old boy in the home did NOT like Minnie and told me she'd scratched him. I asked him what he did to provoke her, but all I got was an innocent shrug as he repeatedly told me how much he hated her. ©2014 Robin A.F. Olson. 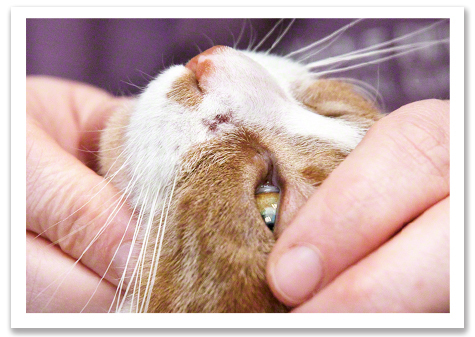 Dr. Mary examines the injuries on Minnie's face. As fate would have it, I got another email about the same time Minnie's problems were starting. This one was from a woman named Susan. She'd seen some news about Kitten Associates and wanted to let me know how proud she was of our work and she also told me about her boy, Duke, her beloved kitty who had died after struggling with heart issues for years, not long ago. Devastated by his death, she and her husband felt having another cat wasn't in the cards. I could tell her heart was broken, so I told her to come over and visit the kittens, just to cheer her up, no strings. No bothering her to adopt from us. That was all. You can guess what happened next. 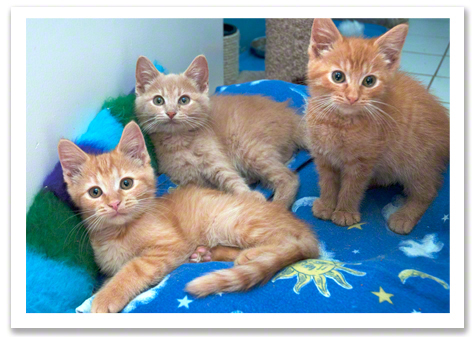 They came over and fell in love with Buttercup, one of the "Clementines" orange foster kittens. Further surprises came shortly after that. Susan was pregnant. When they asked about possibly adopting Buttercup I had to say no. I couldn't let her go to a home with no other pets. Buttercup NEEDS that emotional support from her siblings and with a baby on the way, would little Buttercup be mature enough to handle this life-change? ©2014 Robin A.F. Olson. Injuries all over her face. What happened to you, Minnie? Normally I would have just tabled the conversation, but I REALLY LIKED this couple. They were truly devoted to their last cat. They were respectful to my wishes about finding them a good match based on the cat and their life, not just picking a cute kitten. I thought about it a lot, then I realized that Minnie might be a good choice. She was grown, cute, and was able to get out of the way of any child and had a very mellow vibe about her. At the same time I was discovering that Minnie might be getting beaten up, so I told Susan about her story. Susan read some of my blog posts about Minnie's tough life and fell in love. We decided to take it slowly. 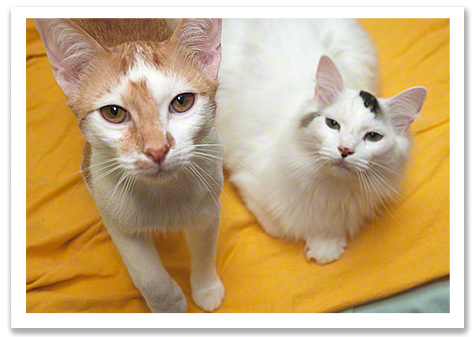 Susan and Barry had never met Minnie and they didn't want to go to her foster home and meet her while she was scared. I agreed to do a home visit and bring Minnie to them. They'd foster her for a few weeks, then either they'd adopt or we'd take Minnie back. It felt right, so that's what we did. I picked up Minnie last night, but first she had to be cajoled out from her finding place-inside the box spring of a bed. This is not a good sign, when there were plenty of places to relax all over the house. Why was this cat away from all the other rooms and hiding in a box spring? I didn't have time to ponder it since I had to get to Susan's. When I arrived, we talked about Minnie possibly being attacked by other cats and probably having spent the past few months being afraid. That she HAD to give Minnie some time, maybe longer than we thought, to blossom again. ©2014 Robin A.F. Olson. A startling discovery-eosinophilic plaque. I let Minnie out of her crate and she began exploring the bedroom where we were going to let Minnie start her new life. Her tail was up. She didn't run and hide. She came over to Susan and rubbed up on her. She did the same to me as she energetically moved around the room exploring all the furniture and rugs. I took out a catnip banana and she went crazy over it. The fearful cat I'd seen not even an hour ago was gone. As Susan and I sat on the floor, petting Minnie, Susan felt something odd. I took a look and in the low light of the room I could see an open, bloody wound on Minnie's left shoulder. I couldn't get a great look at it, but the more I looked at her, the more scratches I saw on her face and neck. I was really pissed. What kind of foster home lets a cat get THIS bad and doesn't NOTICE IT? How MUCH had Minnie been suffering these past months when I was foolishly thinking she was doing just fine-even hoping her foster family would adopt her. ©2014 Robin A.F. Olson. Wondering what all this means and how it happened. It was clear Minnie needed to see a Vet. I called right then and there and got an appointment for this morning. There is no way I was prepared for what we were about to find out. I spent a good part of the drive home guessing at what the vet bill was going to be, especially if we had to stitch up that wound or if we found more problems, like an abscess. This morning, I got an email from Susan saying Minnie was scratching a lot. This had to mean she had fleas! Minnie was cleared of them months ago…in fact she never HAD THEM but we treated her just in case. Now what was I going to do? Susan is pregnant. Minnie had been in her bedroom! Fleas? Chemical agents to remove them? What was Susan going to say about this? Was I going to have to take Minnie home with me? Where in the world would I put her? Frankly, I was pretty miserable this morning. I was angry and worried and scared we couldn't cover the vet bill. Fundraising over the holidays was a total bust. The account is scary-low, but if I'm careful we can limp a long. Susan was right on time. 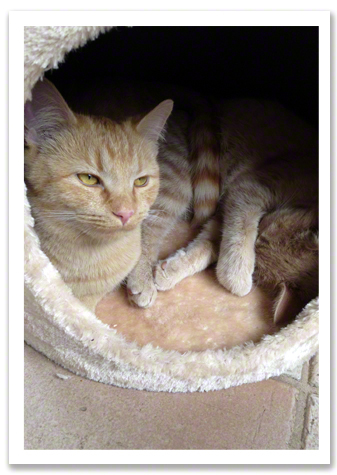 She reported that Minnie wasn't hiding, she was playing eating, using her litter pan, happy to hang out, but itchy. 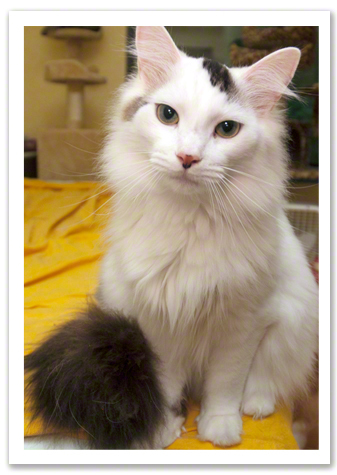 Indeed, Minnie was quite calm in the exam room, too with her tail up, curious, happy, not stressed at all. ©2014 Robin A.F. Olson. Minnie while she was here with us this past summer. I told Susan my fears about fleas and she took it well. I'd packed up every flea treatment I had and was ready to give Minnie some topical flea treatment, but the exam had to confirm it first. Good thing I waited. Dr. Mary did the exam. As always she was sweet with Minnie and ever so careful with her. Minnie responded in kind, keeping calm and letting Dr. Mary do her thing. As Dr. Mary turned Minnie, I saw the wound on her side. As Dr. Mary spoke, in unison we said the same thing. "Eosinophilic plaque!" This was likely a LESION caused by stress that lowered her immune system, followed by an allergic reaction to something. It all became clear. Minnie was having a reaction to being fed DRY CAT FOOD! I'd seen it the week before but was told Minnie didn't eat it, even though the bowl of kibble probably sat there all day long. Even though I provided her food. Even though I checked to make sure they didn't need more and was told she was getting it…there is it..she's so itchy from the junk that she's scratching herself raw. She hadn't been fighting. She didn't have fleas or mites. Susan said she'd been drinking a lot of water, another indicator to me she was given dry food. If I see my cats drink water, I know they are likely SICK. 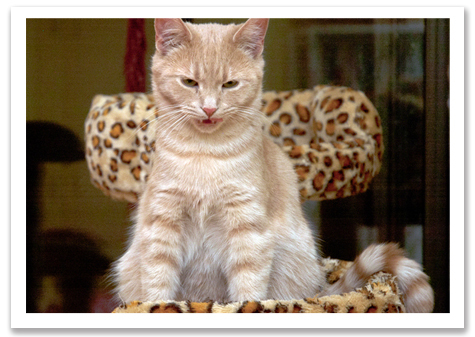 Raw food has enough moisture-and, in the wild, cats get moisture from their prey, not by drinking. 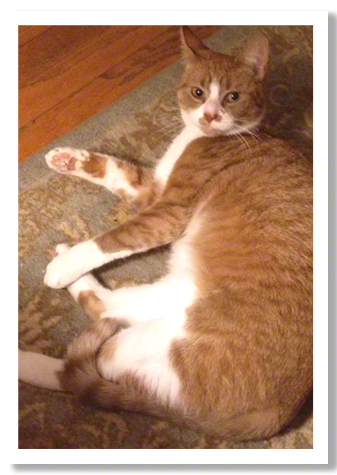 ©2014 Susan W. Minnie the first night in her new foster home. Poor Minnie. If this had kept going, she really would have been a mess. As it is, it will take awhile for her to recover. Not being stressed out will REALLY help and so will a belly full of good, appropriate food. Susan understands what has to be done, but other than good food and love, there's nothing more to do other than keep an eye on it and make sure she's getting better. While at the Vet, Susan remarked many times over how cute and sweet Minnie was, how easy going, how different she was than their old cat, Duke, who fussed and hated being at the Vet. Susan had a gleam in her eye when she spoke about Minnie, even though she's not making any declarations about her future. I have a sneaking suspicion that Minnie may not be in foster care much longer. I like this couple. I like their home. I like seeing Minnie with them. It feels right and in the end, that's all that matters. 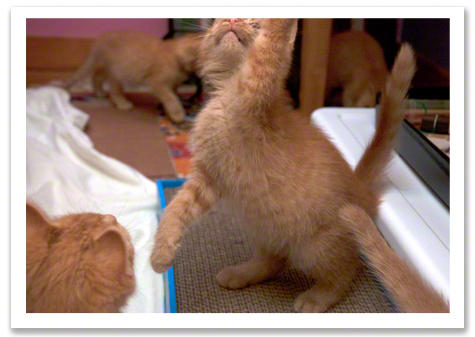 …speaking of baby steps…I have a new foster kitten coming. Some of you may already know him, but for months, behind-the-scenes, since I first saw his face, a little cutie pie is coming to Connecticut. Wait! Isn't my home already stuffed to the gills with foster cats? Actually, no. In the past week, FIVE CATS HAVE BEEN ADOPTED! And that story, my friends, will be the focus of my next blog post. Blossom was up on her paws, walking. I couldn’t believe my eyes. Just hours ago she’d appeared to be near death and now she was looking up at me like I had a bad dream because certainly everything was right as rain. Of course, being that Blossom is part of a litter of 6, I knew that the odds were good that another kitten might fall ill. At least if they did, I knew what to do for them and that with supportive care, they should be fine in day or two. ©2013 Robin A.F. Olson. Puttin' some meat on their bones. 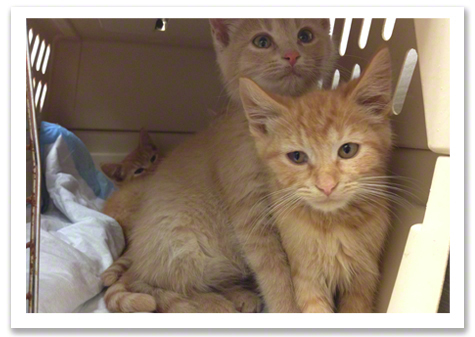 I checked in with one of our Vets, asking him if it was okay to get the kittens their second, in a series of three, Distemper combination vaccinations called FVRCP (Feline Viral Rhinotracheitis, Calicivirus, Panleukopenia) He felt it was safe to vaccinate because it was rare to have a complication after the injection and since Blossom seemed well again that we should go ahead. On Wednesday, October 16th I took the cats to the Vet for their shot. 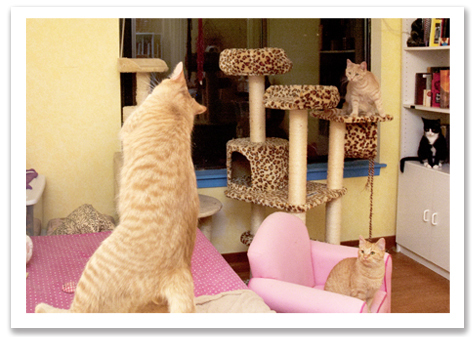 They had a grand time exploring Dr. Chris’ office, though he did not particularly care for them ripping his furniture with their claws. 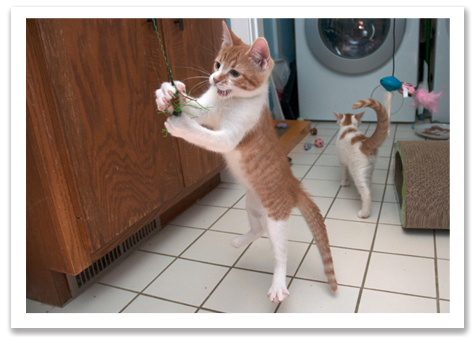 Each kitten got their vaccination in their right front leg. I packed them up into their carriers and brought them home. It was a quick visit. ©2013 Robin A.F. Olson. Little Mandy gets weighed in. I knew the kittens might feel a bit off, a bit more tired than usual, or picky about their food, so I didn’t worry about checking on them right away after I got them home. I waited about ninety minutes before I checked our web cam, Squee-TV Channel 2, to see how they were doing. They were all huddled onto one cat bed. They looked unusually flat. Concerned, I turned off the camera remotely and went into their room. All the kittens were flat. I tried to get a few to walk and they limped on the leg that got the shot, then laid down in place. They felt hot to the touch. They were crying. I knew there was a chance of an allergic reaction to the vaccination and Dr. Chris had closed for the day. I grabbed a kitten and took her temperature. It was 105.2°F. I called the Cat Clinic and Dr. Feldman spoke to me directly. He said he’d make time for them and to bring the kittens in right away. If they were having an anaphylactic reaction they could die. ©2013 Robin A.F. Olson. Sherbert feels awful and Mandy can't even get up (background) they are feeling so poorly. I raced over to the Clinic, swearing under my breath that if this vaccine killed any of my kittens there was going to be Hell to pay. The kittens cried the entire trip to the Vet. At least I knew they were alive. Dr. Feldman and his assistant examined each kitten. They all had very high temperatures of over 105°F. High normal for a cat is over 102°F. They were all lame in their front leg. I worried that the vaccination trigged Calici, which is what might have made Blossom lame a few days before or if the needle used for the shot was too big. I didn’t know if the vaccination had expired or was otherwise hurting my kittens. All I knew is seeing them all suffering was heartbreaking. ©2013 Robin A.F. Olson. Mango and Meri are miserable. Though rare to have such a bad reaction, Dr. Feldman suggested we give each kitten a shot of Dextramethasone, a steroid, to combat the high fever and comfort the lameness. He said I might read that it would invalidate the effects of their vaccination, but at this point we had no other options. 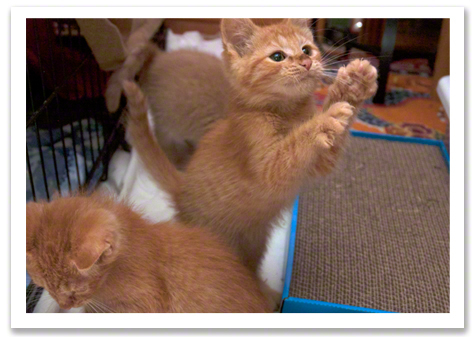 The kittens might overcome their fevers on their own, but at what cost? I knew steroids were NOT what I’d ever want my kittens to be given, but I had to hurry to make the decision. They were suffering so severely and were affected so quickly after their vaccination that I felt our hands were tied. We gave them the steroids. Dr. Feldman is very compassionate. He made sure they used the tiniest needle possible on the kittens. It looked like the width of a single human hair. The kittens cried getting another shot. I felt so badly about causing them any more pain, but we had to do it. I was told to observe the kittens and report back the next day unless they got worse. The thought was that we’d have to repeat the FVRCP vaccination again anyway, so we would just move on, give them time to recover and in a few weeks try it again. We could also pre-treat them with antihistamines before they got the next shot. To be safe, we recorded the lot number and date of the vaccination they got and compared it to what the Cat Clinic would be using when we did the next one. The date of expiration on the vaccination that made them sick is December 2014. 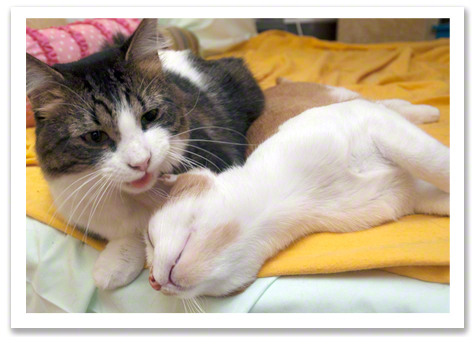 Cat Clinic’s expires December 2015. I had to wonder if the vaccination had already gone bad and that’s what made the kittens so sick. It's on my "to do" list to contact the manufacturer and report this problem. ©2013 Robin A.F. Olson. Since they've arrived a month ago there hasn't been one day when ALL the kittens were well. 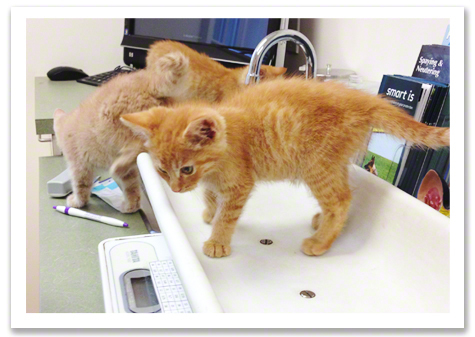 Here's Blossom, Buttercup and Mandy in better days before the vaccination. By the next day, the kittens had bounced back. They were eating and wobbling around. Clearly they were still sore, but doing much better. My goal now was to focus on fattening them up, since they were still looking like furry skeletons, and get them ready to be spayed and neutered. I wanted them up for adoption soon while they’re still small. Part 4 coming up next where I face the real possibility that one or more of the kittens will lose an eye due to illness. We got home around 1 A.M. 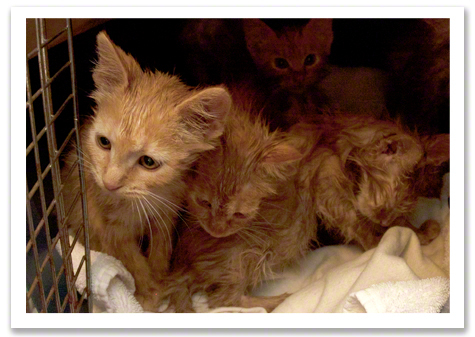 The kittens were ready to explode out of their carrier and I felt badly confining them to a large dog crate for the night, but I had to contain the fleas, as well as the kittens. I got them settled and brought them food, wondering if they would even eat. I knew they’d been fed all sorts of dry food and that transitioning them over to grain-free canned might be tough. ©2013 Robin A.F. Olson. 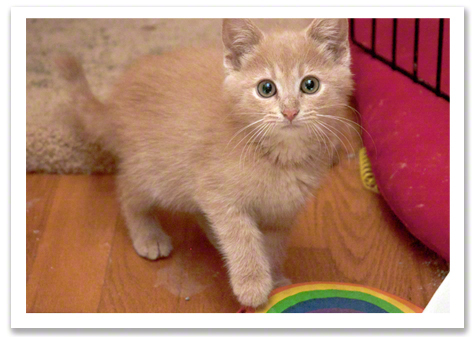 Our first look at Buttercup, the sole buff colored kitten. The kittens went crazy for the food and ate so much I had to keep bringing them more. 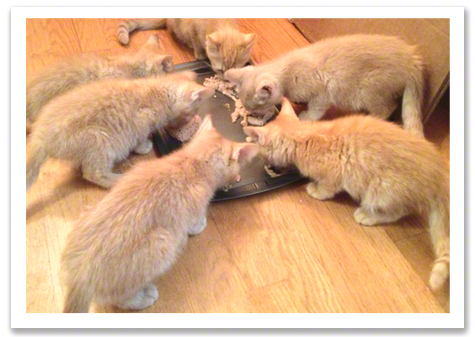 For six little guys they ate three, 6-oz cans of food. If nothing else, they would be able to rest now that they had a full belly and a soft bed. 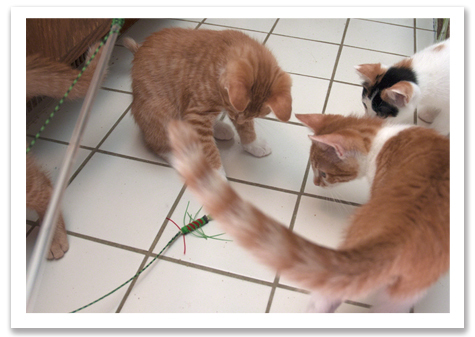 The kittens had been removed from the shelter in two groups. The first one to get out was a solo kitten named Blossom, along with a dilute calico who was on her own and not part of Blossom’s family. 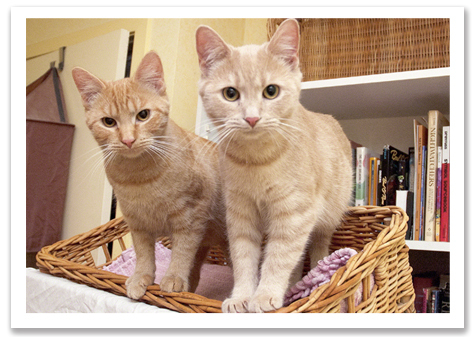 They left the shelter and entered rescue days before I even knew about the Clementines. ©2013 Robin A.F. Olson. Out of the cage and ready for fun. Because Blossom got out earlier she had advantages over the others-access to better food and more of it, a less stressful environment and a lot more love. As a result, Blossom grew much larger than her siblings as they continued to wait in hopes of rescue. It meant, at least, Blossom should do better than the others, but I was wrong. Blossom was the first to get really sick. The next morning all I had to do was feed the kittens and load them into the carrier, but I needed a few minutes with them before we left. I wanted to have a chance to at least get a good look at the little guys, maybe grab a few photos. Even knowing about the fleas, the poor kittens wanted to run around so I let them out of the crate. They raced around the room, exploring every nook and cranny. Each one came over to check me out, too. A few were purring at the slightest touch. The energy in the room was one of joy and I couldn’t help but feel charged up by it. ©2013 Robin A.F. Olson. The littlest, Mandarin (Mandy). My joy was short-lived when I saw Mango. His left eye was runny and swollen. 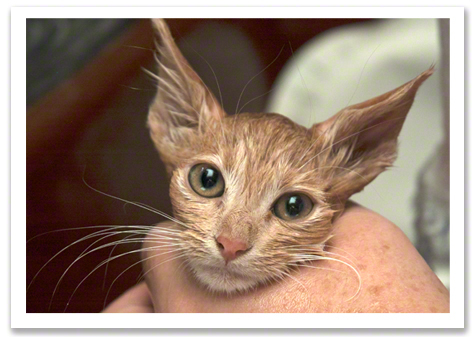 The folks in Kentucky had mentioned eye issues in two of the kittens and that the Vet had put “salve” on them. I cringed wondering if it was vasaline or if it actually was medicated and I wondered why they didn’t include the meds along with the kittens. 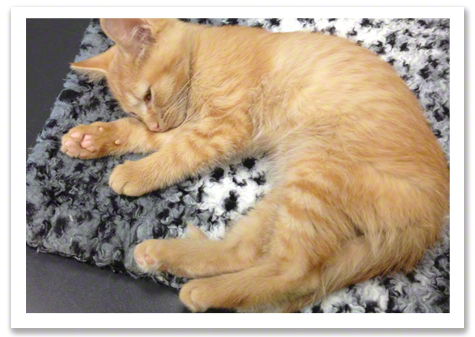 Due to the laws in Connecticut the kittens had an appointment to see one of our Vets in a few days to be issued a health certificate, but looking at Mango’s eye, I knew it couldn’t wait. I called for an appointment to see Dr. Mary and asked our new foster mom if I could delay getting to her. ©2013 Robin A.F. Olson. This can't wait a few days. Off to the Vet with Mango and gang. 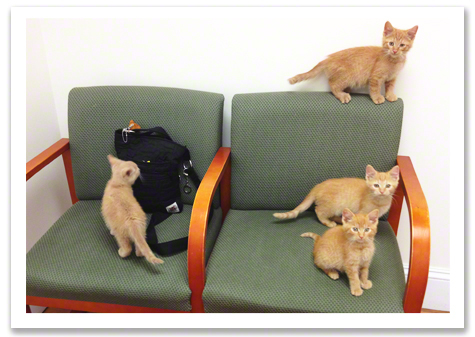 The kittens had fun at with Dr. Mary. She examined a few of the kittens and we discussed treatment plans. I asked about treating them for fleas but she said there was no way we could do anything more than bathe them at this point. I was to treat everyone with eye drops and hope that would do the trick. She said she wished we could get terramycin because it’s the “go to” medication for this sort of conjunctivitis, but it’s on some sort of universal outage for vets. They can get it for newborn babies, but that’s about it. In fact there’s a program in Philadelphia where a hospital donates their one time used tubes of terramycin to animal shelters so they can get access to the drug. I don’t know why this is going on. Is Pfizer causing a shortage on purpose to make a buck? I didn’t understand. All I knew is that Dr. Mary had just met another vet who said they could get it but it was very tough and if they didn’t respond to the current treatment we’d get the medication. ©2013 Robin A.F. Olson. Spring fling. The plan was to take the kittens to their new foster home and see how the meds worked. I was very relieved they were out of my house because the cat population was up to 22 cats and that just didn’t sit well with me. Every spare room was loaded and I was grateful that Jeannie offered to help. Without her home I would increase the risk of illness racing through the other cats. The more cats, the more stress, the better the chances that things will go downhill fast. ©2013 Robin A.F. Olson. 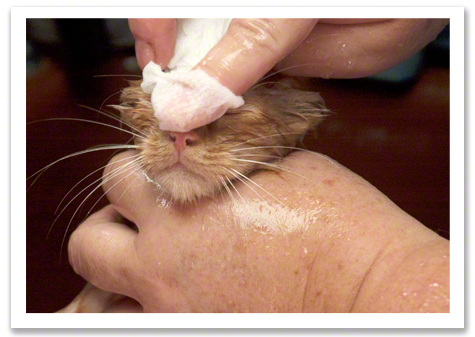 Buttercup gets a bath. Jeannie is great. She’s got a big smile and friendly, chatty demeanor. 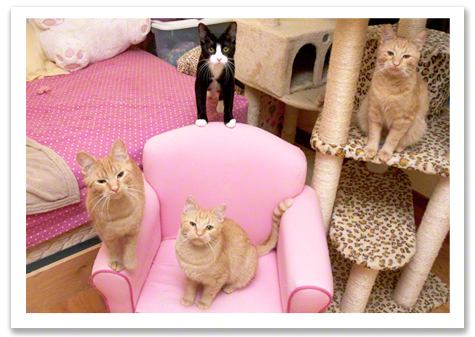 She’s fostered all sorts of kittens in all sorts of situations. Nothing fazes her. She actually wanted to bathe the kittens and has a routine all set up. I knew I could learn from her and was eager to get these kittens cleaned up. ©2013 Robin A.F. Olson. Yikes. We set up an assembly line. Jeannie bathed the kittens and picked off the fleas. I dried the kittens and placed them into a big cat carrier that was lined with a thick blanket and had a small space heater blowing warm air into the space. Jeannie cooed over each kitten, talking to them about how we’d get those nasty fleas off them, and saying how cute each one was. 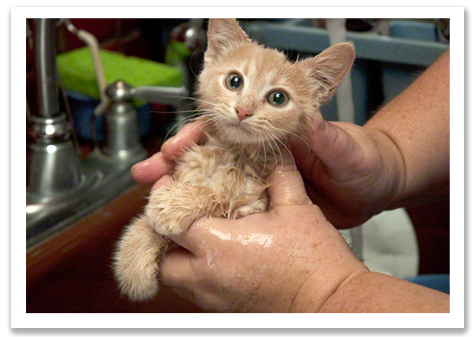 It wasn’t until we bathed the kittens that I realized how very underweight they were. They were basically skeletons with fur, made more extreme by seeing them wet. One of them, a tiny little girl, seemed so fragile I worried if she got sick we’d lose her. ©2013 Robin A.F. Olson. Oh the humiliation! One by one the kittens got bathed. They were either relaxed by the warm water and got sleepy, or being so malnourished they went limp in my arms since many struggled against being in the water. It was rather unnerving to see them like that. It took them awhile, but with the warm air and being clean they slowly began to groom themselves and show signs of life. Jeannie was ready to take over the helm and I had to race off. Why? To help another family of kittens who were arriving on a transport from Georgia get to a temporary foster home for another rescue group. It meant having a chance to see our dear friend Bobby and I couldn’t pass it up. 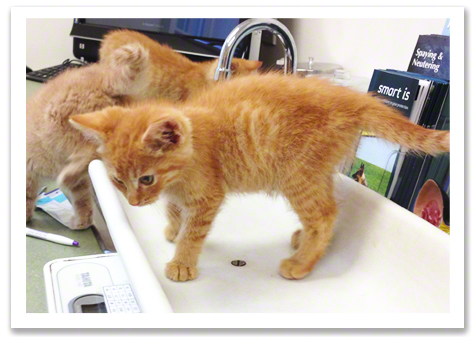 A few days later I had to bring the kittens to another Vet for their health certificates. I told Jeannie I was going to bring them back to my house after the vet visit because we’d been fortunate enough to adopt Lolly and Clark and their room was now open and it would give me a chance to get a few photos of the kittens and see how they were doing. I’d bring the kittens back in a few days or we’d take on other kittens for her. ©2013 Robin A.F. Olson. Wet and flea-free. The vet visit was unremarkable in nature. What we’d already started doing based on Dr. Mary’s orders was fine to continue doing. I went home thinking things would be all right. ©2013 Robin A.F. Olson. Having fun wherever they go. On Friday, Blossom seemed picky about her food. On Saturday, clearly she wasn’t feeling well. Jeannie and her friend stopped over to see the kittens and we examined Blossom. We took her temperature and it was 105.2° F but then her friend reminded us that Blossom had been laying on a heated bed. Relieved it probably wasn’t a fever, we still noticed she seemed lethargic and depressed. Jeannie has a medical background and suggested taking Blossom home with her where she could give her round-the-clock care for the next day or two. We went back and forth about what would be the best thing for Blossom. Would it be safer on the others if she was separated from them? ©2013 Robin A.F. Olson. What? We're not doing anything! I was ready to let Blossom go with Jeannie, but then we got her to eat a little bit. I knew if Blossom got worse I’d have to run her to the Vet anyway so I told Jeannie I’d take care of her. The next morning, Blossom didn’t want to walk at all. She was like a limp rag in my arms. She wouldn’t get up to eat and she was crying. I tried to get her to walk but her back right leg was tender and she favored it. I’d read about kittens limping being a possible sign of Calici virus and I started to panic. Dr. Mary and Dr. Larry were off, being that it was Sunday, so I took her to their associate, Dr H. I have to admit I’m not a big fan of Dr. H, but she is the only game in town, unless I wanted to spend $1000.00 or more going to the ER Vet. Dr. H. barely looked at Blossom and talked to me about what she wanted to do. I had to ask her to watch Blossom try to walk and talked to her about my concerns about it being calici. What sort of exam is it if she’s not even looking at the kitten walk or checking out why she is lame? ©2013 Robin A.F. Olson. Trying to get Blossom to eat. I felt like she was ignoring me and talked about levels of care and their costs. She wanted to do full blood work, x-rays, repeat the snap test, and a PCR test and pain meds. I told her it was very clear to me it was calici and I didn’t want to do all these tests. Yes, Blossom could have fallen but there was no obvious sign of injury and she was painful all over her body, not just her leg. ©2013 Robin A.F. Olson. 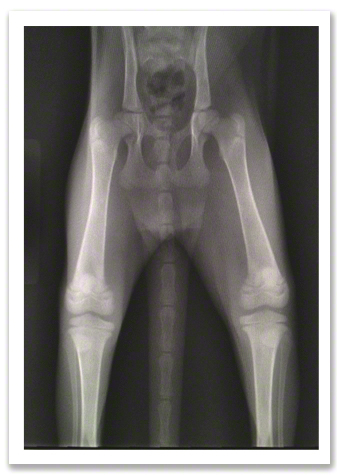 Blossom's x-ray shows good growth plates but no issues. Dr. H. wouldn’t let up so I said to go ahead with the blood work and x-ray. Both were normal. Now I was out $500.00. I was really pissed. I was to take Blossom home and give her sub-q fluids a few times over the next two days. If it was a virus, giving her antibiotics wouldn’t help, but the fear is secondary infection. I said no to the antibiotics, but got pushed into getting pain meds. She wanted Blossom on Buprenex because letting her suffer wasn’t fair. Again, I felt it was off base. When I get a bad cold, I feel like crap, but I don’t want to load myself up with drugs that give me more problems than help and this was a little kitten. I thought supportive care was what she needed, not more drugs that really only make her loopy and possibly lose her appetite…which again..does not make sense. Why make it harder for Blossom to recover by taking away her appetite? It was the only thing she had going for her. At least if she couldn’t get up I could feed her if I held the plate next to her mouth as she laid on the heated cat bed. ©2013 Robin A.F. Olson. My poor sweetie. Blossom was wiped out from the virus. I feared that Blossom was going to die she was so weak and then I started to wonder if this was going to become my worst fear—some sort of terrible virus wiping out the whole litter and Blossom was only the first to go. The next day I didn’t believe what I saw when I entered the foster room. When I looked at Blossom all I could do was shake my head in disbelief. Your cats are bored. They get into fights. They bite your ankles or the just lay around with a glazed look in their eyes. They're little hunters with nothing to hunt (unless you let them outside, but please don't do that!). Can you imagine not having an outlet for your deepest desires? To be crass, that would really stink. I try to have play time with my cats every night, but getting them to chase after a toy can be daunting because my cats are either 2 years old or 12 years old or older. What would I use that appeals to all of them? 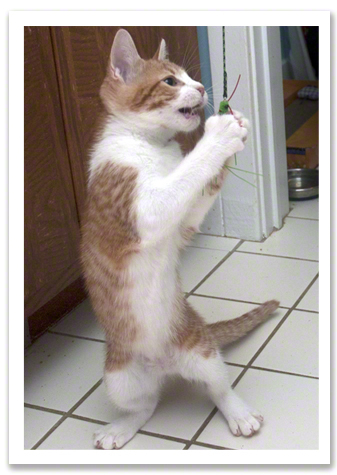 Some cats are “air hunters” while others prefer to stalk prey at the ground level, so I'd need a toy that works well dragged on the floor, mimicking the movements of a bug, and something I could gently whip back and forth to get my air hunters to jump. ©2013 Robin A.F. Olson. 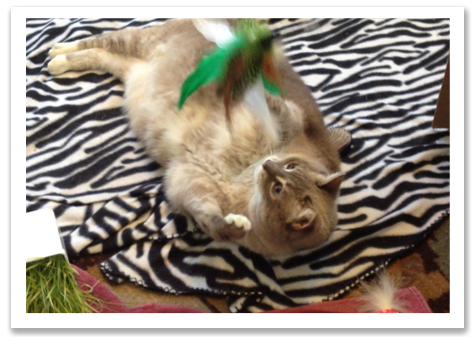 Stan is the consummate high-flyer when Neko Flies are around. Usually I've solved this problem by having more than one toy in my arsenal. 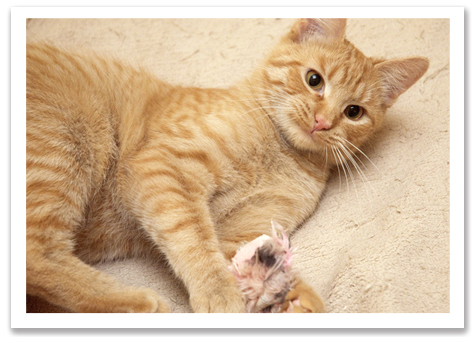 I still believe that you should offer options for your cats, from small balls to faux mice and catnip laden toys. That said, I can only hold so many toys in my hand at one time and I needed something that covered all the bases. At last I've found a series of interactive toys that gets cats off their big behinds and turns the lights back on in their eyes. I give you, Neko Flies! ©2013 Robin A.F. Olson. Jellybean Mel inspects mysterious package. Unlike many wand toys I've used in the past, Neko Flies feel well made. Their clear plastic rod has a comfortable rubber grip. 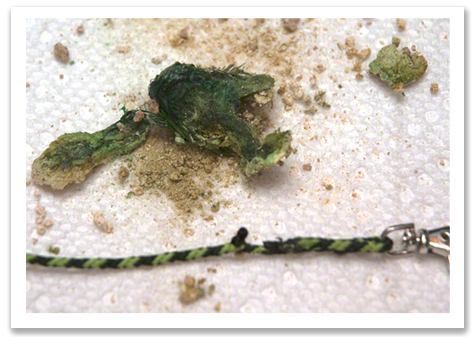 At the opposite end of the grip is a clip with a charming braided green and black cord that's attached to a variety of “Lures” that resemble and move like real bugs or mice. ©2013 Robin A.F. Olson. Gracey grabs her Kattiepede. Ellen, the creator of Neko Flies, underscored the importance of creating unique, carefully crafted (some elements are done by hand) toys that are as safe as possible for cats. She told me they constantly look for ways to improve their product, from finding ways to use less glue (they already only use a few drops), to finding thicker material for the wings of their Kragonfly cat toy as well as for better ways to anchor the loop into the toy so it doesn't pull free when cats tug on it. 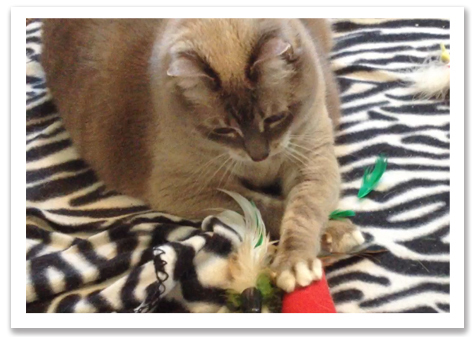 Ellen seems almost obsessed with designing toys that truly appeal to cats and are not just a collection of feathers glued to a string or that utilize materials that are so cheap they fall apart after one use. ©2013 Robin A.F. Olson. What IS this?! It was tempting to write the world's shortest review by stating: I LOVE NEKO FLIES. Rather, my CATS love Neko Flies. 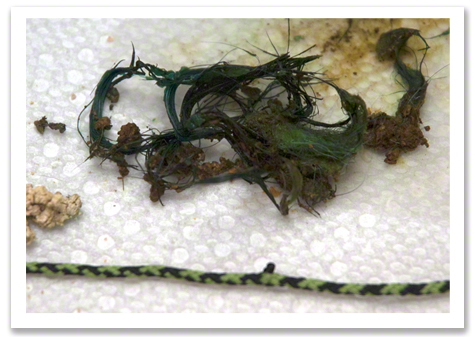 One of the cats bit the green and black cord, severing one-third off it, along with the Kragonfly. I took the fly away so they wouldn't eat it, thinking I would just trim the end of the cord and reattach the Fly to it. 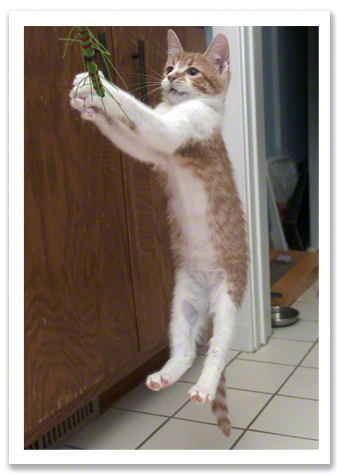 In the meantime, since I was cooking dinner and trying to play with the cats at the same time, I would just have them chase after the string, without the toy attached because they seemed to like it just fine. Ahhh…hindsight is 20-20 vision, as they say. ©2013 Robin A.F. Olson. Love at first bite. 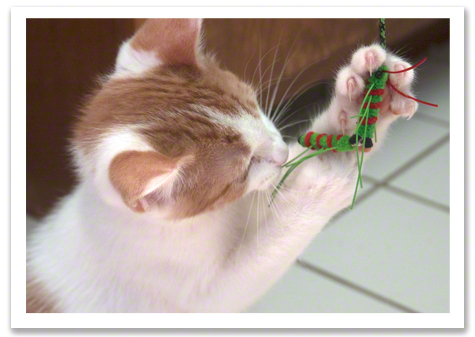 Some cats become so enamored and hooked on NEKO FLIES that they have been known to try and get the toy off a shelf by themselves! 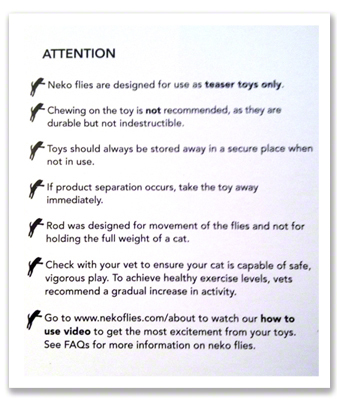 This is an interactive toy for a human to play with the kitty, so keep your Neko flies tucked safely tucked away in a drawer or closet until you are ready to play with your cat again! I turned my back on my cats to check on dinner. I didn't even leave them alone for more than a minute. I looked back and the green and black cord was one-third the length it had been. Clearly, one of the cats had chewed it off and possibly EATEN IT. In decades of being a cat-mom, this was the first time I ever had to worry that a cat ingested such a large part of a toy. I searched the living room. I knew the culprits were either my tiny foster cat, Mabel or my big bruiser, the DOOD. I had a bad feeling it was DOOD because he's, well, not the sharpest pencil in the box. ©2013 Robin A.F. Olson. Stanley goes nuts for Neko. I couldn't find a thing. In a panic, I called Neko Chan, home to Neko Flies. Ellen, herself, called me back right away. We talked about what materials were used in the cord (polyester).I called the ER Vet and told them about what material I believe one of the cats ingested and they suggested I bring both cats down, spend $1500.00 per cat on endoscopy-that was IF they could get an internist to come to work late on a Sunday night. They also told me to get a cat to vomit is some sort of “holy grail” treatment because the chemicals they might use to make them vomit usually kills them.They told me to watch for the cat to become listless, vomit, not eat and if that happened to RUSH them in for EMERGENCY SURGERY because the cord could twist up in the intestines and basically KILL the cat. OR…it might pass on its own…out the “other” end. ©2013 Robin A.F. Olson. Petey prepares to pounce. The next few days were absolute Hell on my nerves. I ripped apart the living room the next day and checked everywhere I could, but no string was found. I hovered over the DOOD and Mabel, but they ate as usual and seemed unaffected. Then I started to worry that maybe it wasn't them, but another cat. I have 9 cats running around! This was going to end badly, I just knew it. Ellen checked in with me, hopeful I had good news, but there was no sign of the missing string. I thought maybe I was getting Alzheimer's and this was the first sign? I was so paranoid that I carried the remaining section of cord in my purse, in case I had to take one of the cats to the ER so they would know what to look for yet still…nothing. ©2013 Robin A.F. Olson. Gracey and Joey enjoying their new toy..
Six WEEKS passed. I was getting breakfast ready for the kittens and I saw a GREEN ball with pale colored ball next to it on a paper towel on the counter. I asked Sam what it was and he said he found it when he was scooping the litter pan. I looked at it for a moment, then the alarms went off in my head. 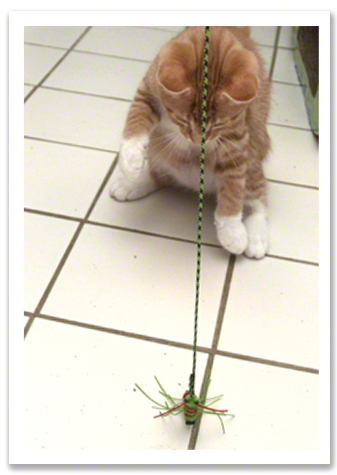 It was cat excrement with the STRING from the Neko Flies in it! ©2013 Robin A.F. Olson. Woah. Green Poo (and no ham). Being the offspring of two scientists, I HAD to get a magnifying glass out and inspect the green stool. We feed our cats a raw diet so their stool is VERY pale, hard and dry. I teased apart the green ball and saw fibers. I put the section of string I had in my purse next to the questionable object and the color matched. Whoever ate the string passed, at least some of it out. Thank God. ©2013 Robin A.F. Olson. 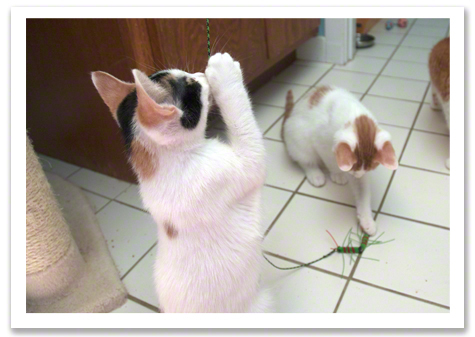 Six weeks later, the green string is found. Although I'll never know if that was ALL of the string, hopefully it was enough so that it won't adversely effect the cat who ate it (most likely the DOOD). 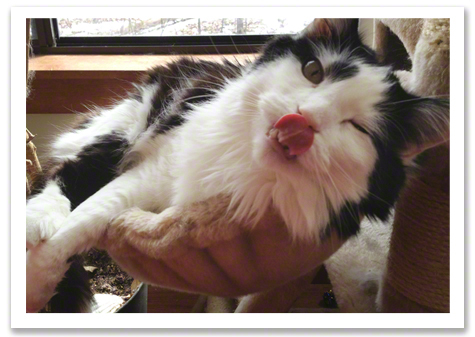 I don't know if the raw diet slowed the process down since the cats don't pass much stool or if it helped. All I care about is that my cats are fine and my pocket still has a few bucks in it. After all this would I still tell you to go out and buy Neko Flies. Absolutely, YES I would! I want you to know about my foolishness so that you truly appreciate the warning from NekoChan. Their toys are so enticing we must be careful in how we use them and our reward for that mindfulness is that our cats will get the exercise they need and have their hunting desire sated. I'm still using the Kattipede today and hope to add more Lures to my collection soon. 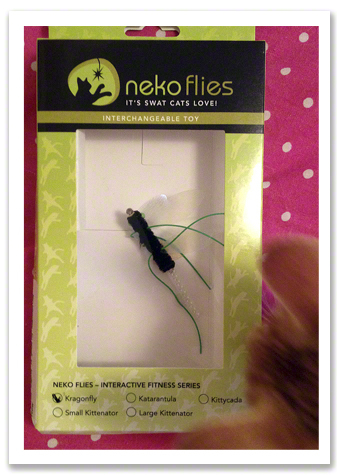 If you'd like your very own Neko Flies: Foxifur Kittenator with Rod, simply leave a comment in this post to enter. Tell me what's the weirdest thing your cat has eaten or just give me a good reason why you should win. Make it funny, entertaining, creative. 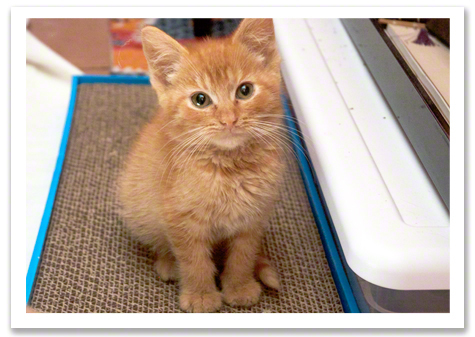 Best entry as Judged by me, Robin Olson of Covered in Cat Hair, will win ONE FOXIFUR KITTENATOR with ROD. You may only leave ONE comment for ONE CHANCE to win per person. This Giveaway ends FRIDAY, AUGUST 30, 2013 at 11:11 AM EST and is open to residents of the USA and CANADA (yay Canada!) only (sorry guys outside of those areas!). Rules, quantities and whatever else I forgot are subject to change without notice. ©2013 Robin A.F. Olson. DOOD. After careful consideration, from time to time I write product reviews. If you see it here, it's because, at LEAST I think it's worth you knowing about even if I have an issue with it and, at BEST, I think it's amazing and we should all have one, two or more of whatever it is I'm reviewing. I get NO reimbursement for writing these reviews, though to write a review I am supplied with the item, as I was in this case. This review is MY OPINION, ONLY. The result you experience using this product may differ (I can only hope there will not be any ER Vet visits!). 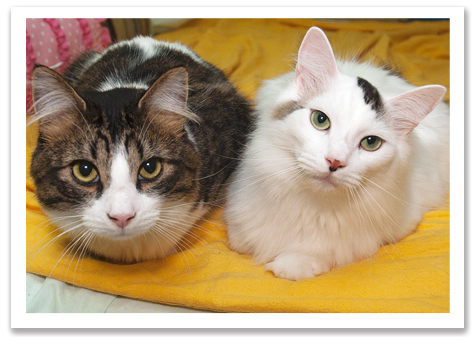 In October of 2012, we rescued two cats. One cat was on “death row” at a municipal shelter and the other was toughing it out, a dumped stray cat, who chose to seek help at an apartment complex where the owner was considering poisoning the many homeless cats on the property to “deal with” the situation. ©2012 Maria S. (inset) ©2013 Robin A.F. Olson (main). 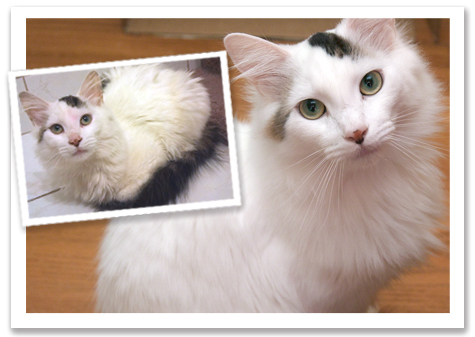 George with a lipstick stain on his forehead and ratty coat right after being rescued and now stunning beauty. 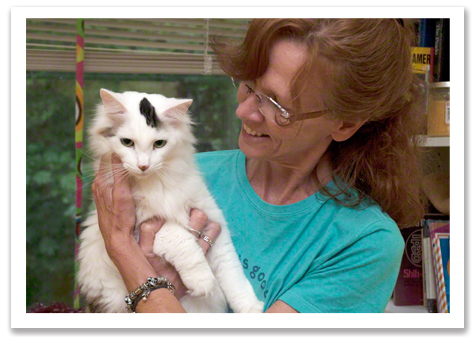 It's not easy for us to take on young adult cats because without a brick and mortar facility, where folks can come and see our cats, it takes a long time to find forever homes. People will make an effort to go through the application process and home visit for a kitten, but for an adult, that's another story. ©2012 Maria S. (inset) ©2013 Robin A.F. Olson (main). I can't get over the transformation of Bongo! He weighed four pounds on intake. So here we are, eight months later with our cats Bongo and George. They've both blossomed from being underweight, flea-covered, suffering with ear mites and tattered coats, to magnificent, radiant, affectionate beings. Looking at their before and after photos surprised me. I hadn't realized how far they'd come. It makes me proud to see their positive transformation. ©2013 Robin A.F. Olson. Oh George, I will forever swoon when I think of you. There were a few bumps in the road, particularly with Bongo. I noticed he'd pant after a short period of playing and at rest his respirations were far faster than the normal, roughly 20-40 per minute. This concerned me greatly because I'd lost a cat to HCM, hypertrophic cardiomyopathy and the only sign I had that something was off was his breathing had a “hitch” to it. By the time I knew he was really ill, it was too late and he passed away during attempts to treat him. Ever since that horror, I've been more vigilant. ©2013 Robin A.F. Olson. Barney and George. I brought Bongo to visit a new Vet, Dr. J., and he examined Bongo carefully. They did some blood work, a chest x-ray and some tests. One of the test was for Heartworm and the other was for Bartonella, either issue could cause Bongo's problems though it was less likely that Bartonella had anything to do with his respirations, but it might have an issue with his chronic loose stools. The tests showed that Bongo was negative for heartworm, but a STRONG positive for Bartonella which is transmitted by flea bites and IS contagious to humans. In humans it's nickname is Cat Scratch Fever. 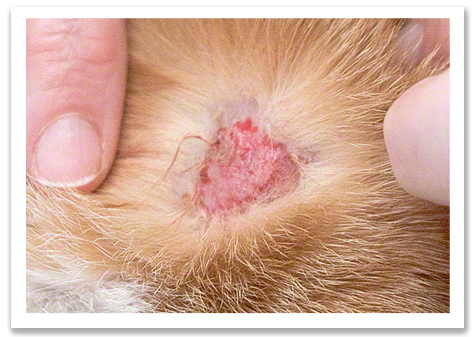 I urge you all to learn about Bartonella (which can also be called, Mycoplasma) because it can mimic MANY other health issues in cats. Look out for upper respiratory issues that just won't clear up, especially eye problems. Look for digestive issues, too, like chronic loose stool. If you run a stool sample on your cat and it keeps coming up negative and you've de-wormed your cats according to your Vet's recommendations, then consider testing for Bartonella. I mention this because more and more Vets are starting to test for this. 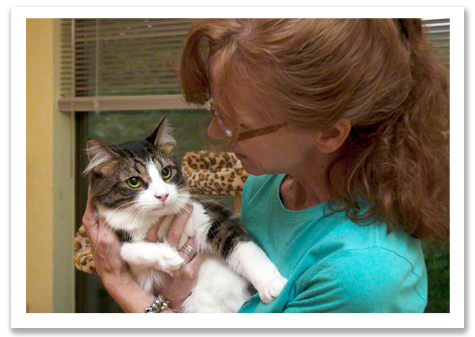 They're seeing cats with very few symptoms or NO symptoms and have it. I do random tests on my own cats and was shocked that some of them had it and they do NOT go outdoors. ©2013 Robin A.F. Olson. 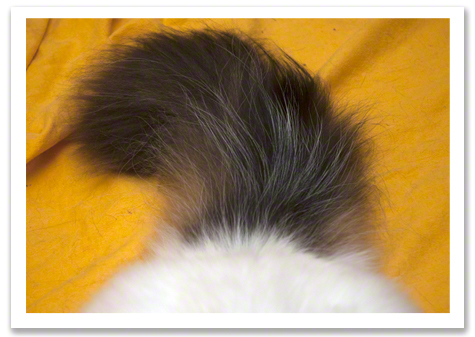 The tail of tails. We decided to do the treatment for Bartonella, then wait to see if Bongo improved before going to the next step, which would be doing an echocardiogram, the only way to see the thickening in the walls of the heart that is indicative of HCM. Meanwhile, life in the foster room had improved for Barney, who during the past six months has been over grooming his fur, leaving shocking bald patches on his sides and belly. I'd been running Barney to see Dr. Mary and we did some tests, but nothing helped. I didn't want to put Barney on steroids because they truly harm so many systems in the cat that it's a last-ditch treatment in my book. ©2013 Robin A.F. Olson. Bongo-loaf. ©2013 Robin A.F. Olson. Geogre can you stop being so pretty? The pace of each day fell into a familiar routine. Each night I'd sit with them for a few hours. We'd have play time, snuggle time and a snack. Bongo and George would often lay in my lap and give me those lovey-eyed looks that made me want to keep them here for good. But I was waiting. I knew I had a home for Bongo, not long after I rescued him. A friend of mine brought over a donation of cat food from a couple whose cat had recently died very unexpectedly. The FIV+ cat had had its' leg amuputated, and not long after, the Vet had over-prescribed medication for it, which ended up killing the cat. ©2013 Robin A.F. Olson. George and his mama-Beth. I wrote the couple a very nice thank you note and sympathy card for their loss. A few weeks later, in late December of 2012, I got photos and a heartbreaking letter about their wonderful kitty. Clearly, these people LOVED their cat and even mentioned that “one day” they would want to adopt another 3-legged cat. I knew right then and there that Bongo was going to be theirs-maybe not today, but some day. ©2013 Robin A.F. Olson. Bongo and Mama. Six months later, the couple reached out to us and asked about Bongo. They wanted to make sure they could adopt him, but could I hold onto him for a few weeks while they do some home repairs? The last thing they wanted to do was bring in a new cat and stress him out. 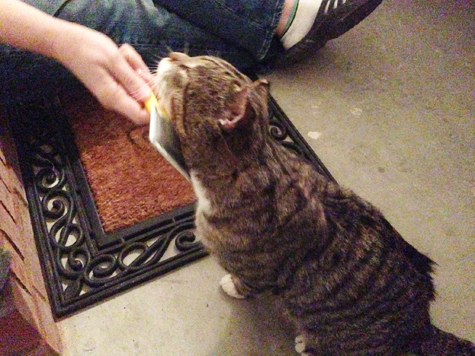 I didn't mind the added wait and they graciously brought me cat food to cover his extra time with us AND a PIE (for me and Sam!). ©2013 Robin A.F. Olson. 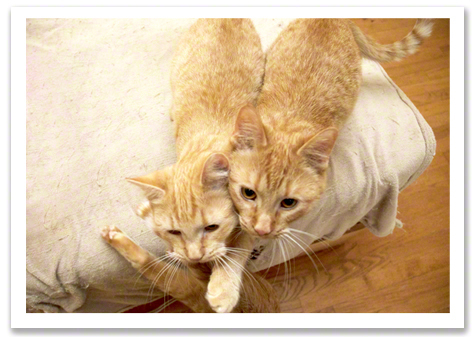 Newly minted brothers, Bongo and George. 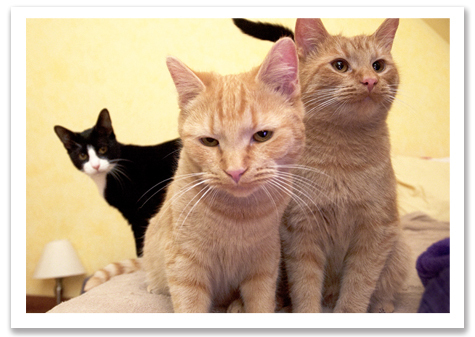 Meanwhile George's adoption fall through, twice, with the same family. Though I was very sad it didn't work out, with George being available again, once the couple saw him, they knew that he needed to be part of their family, too. That meant Bongo and George would be brothers and have a wonderful life together. ©2013 Robin A.F. Olson. Barney reaches out for a kiss goodbye, which Bongo graciously gives him-though it doesn't look like it in this photo! 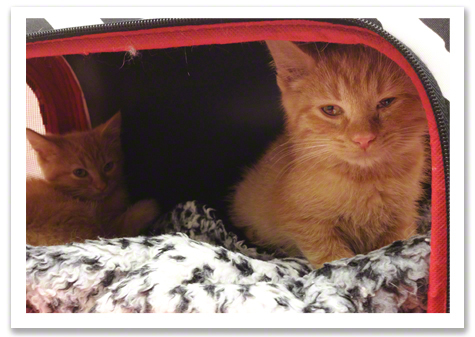 Though having fosters cats here for many months is not ideal and keeps us from helping more cats, knowing that these two will be going to a fantastic home, where their every need will be met, where they will be looked after and cherished, is a thrill. They're both such deserving cats, I can't help but smile thinking about them leaving us. ©2013 Robin A.F. Olson. Barney still waits for a home. His Petfinder page is HERE. I love both cats dearly and will miss them very much, but this time there are no tears. I won't be worrying that they won't get what they need as I sometimes do after adoptions. My focus now is to find a home for Barney, who just had his first birthday and who still has no one interested in adopting him. It makes me so very sad. 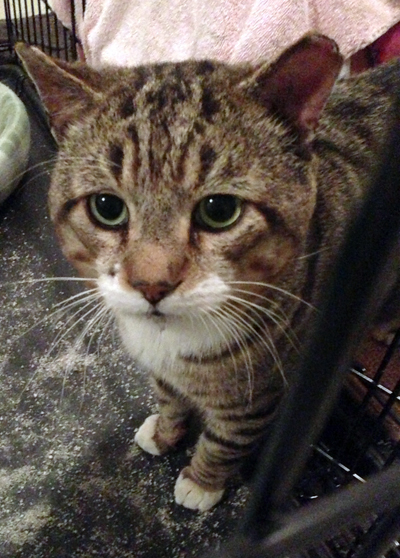 Barney is the sole survivor of his litter and is the most easy-going, friendly cat you'd ever meet. He makes me laugh with his silly antics. I just wish someone else would see that and want to open their home to him. ©2013 Robin A.F. Olson. Bunny is waiting, too! 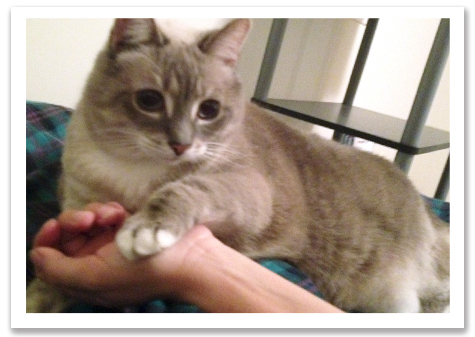 Here's her Petfinder PAGE. 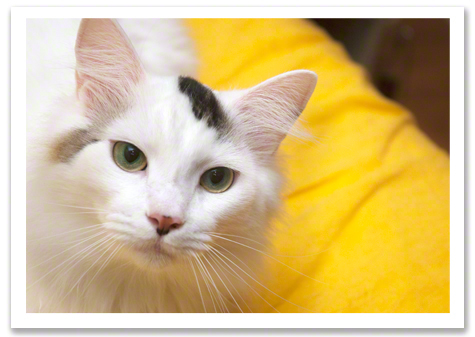 Barney is also very close to Bunny Boo-Boo, who with her shyness is going to be tough to find a home for. She's sweet and playful and loves other cats, but she tends to hide when new people enter the room. Perhaps with George and Bongo on their way to their forever home, she'll have a chance to flower? I guess we'll just go back to waiting and hope that one day the family for Barney and Bunny will contact me so they can find their rightful place in the world, just as Bongo and George have. Chloe’s been living with foster mom, Angi for six weeks. The fact that she’s in the same home is in and of itself a wonderful thing. With her aggression issues, Chloe could easily have been sent back to Animals in Distress and possibly been deemed unadoptable, leaving her to possibly face a grim future. 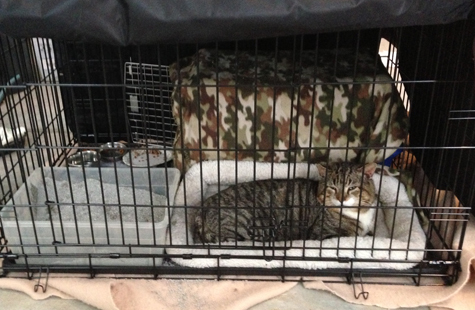 Her former "guardian" had called around to the local Vets asking for a house call to euthanize the cat. Thankfully, though they are not bound by law to do so, all the Vets he contacted would not do a “convenience-euthansia,” especially for a cat they had never seen before. How did they know the cat wasn't aggressive due to an underlying illness? I was dismayed to learn that my own Vet said there are some Vets who will do anything for a buck. Sadly, cats are still considered personal property, which means that said property can be disposed of at the owner's discretion. Luckily for Chloe she has a few Guardian Angels looking out for her, especially her foster mom, Angi who has stuck by Chloe through thick (and we’re working on thin). ©2013 Angi Shearstone. Chloe, relaxed and enjoying her toys. “Chloe let me pet her, brush her, and play with her a bit with her catnip carrot. She purred throughout nearly the entire exchange, rolled around playfully, even, and I think I have identified her "pay attention to me" meyow over the "I'm gonna get you!" war-cry yowl. “Baby gate is going well. Rudie's popped in to be a minor nuisance a few times, but only minor. Some hissing, but everyone's keeping their distance. I have to pick up Chloe's food to prevent the oranges [note from Robin: two of Angi’s cats are called “the oranges”] from scarfing everything up (they're sort of garbage disposals!). ©2013 Angi Shearstone. Rudie checking out Chloe's room. Should he jump the baby gate or not? “I'm actually starting to suspect she'll love anyone that plays with her a few times a day, as well as offers scritches. 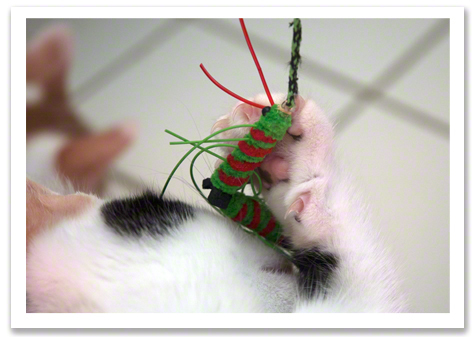 I really do think that being able to interact via some cat toys was key to her getting her "frustrations" out. Really, I think she was starved for quality interaction for a long time. ©2013 Angi Shearstone. Bring on the skritches. ©2013 Angi Shearstone. 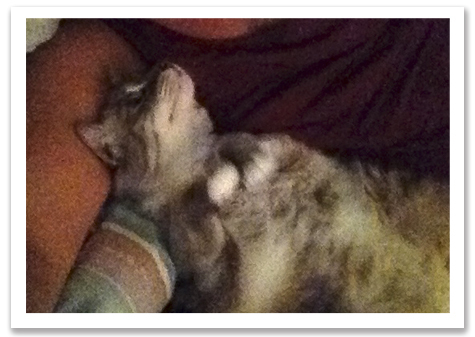 A happy kitty thanks to foster mom-Angi. “Chloe is doing even more amazingly awesomely. So much so that I'm not taking so many pics & video anymore because it's losing the "OMG!" factor. ©2013 Angi Shearstone. 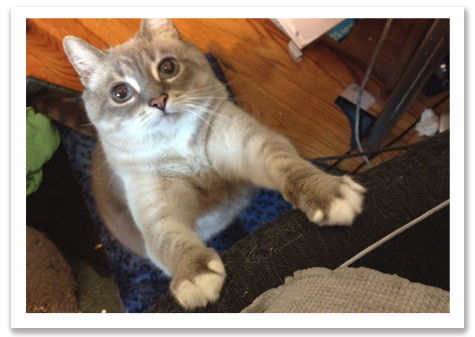 While working, Angi looks down and sees Chloe, reaching up to get her attention! ©2013 Angi Shearstone. Completely vulnerable with her belly up, Chloe lays on the sofa and watches TV with Angi. Is this love? ©2013 Angi Shearstone. She's just a cat, doing regular cat things. That this happened is far from regular. When I met Chloe back in March I couldn’t even touch her. She was ready to attack me with whatever she had, claws or no claws. If I hadn’t seen her behave normally and confidently before she went into defense mode, I would have been hard pressed to even consider giving her a chance. In that glimmer of sweetness, I saw hope and we had to try to help her. I’m so very glad I stepped in to assess Chloe because if her former “owner” had his way, Chloe would have been dead by now. Instead, Chloe is finding out what it’s like to live a life without abuse or neglect, a life that has richness, love and companionship. ©2013 Angi Shearstone. Friends at last. Way to go Angi & Chloe! Chloe was willing to give us a chance, too, even if perhaps we didn’t show well when we first met her. It just goes to prove that with patience and a lot of work, every cat can blossom in time. All photos and email-quotes Used with Permission. I'd like to write a meaningful update about Fred, but the truth is I've become incapacitated by this horrific situation. Words are very hard for me to come by. I'm focused on providing round-the-clock care for Fred, for arranging his next test or Vet appointment and for finding a way to pay for it all. Kitties for Kids is a WINNER! On December 14, 2012, after my town's heart was broken, I sat on the sofa watching the news in tears. I couldn't just sit there and do nothing. I didn't have much to offer, except a house full of cats and foster cats. I realized not everyone knows what it's like to be in the company of so many cats at one time and perhaps there was something about the wonder of living with cats that I could share with others. I knew we couldn't take the cats out into the public because that would be a hot mess. I left that job to the therapy dogs. I worried about opening up our home to the residents of our town. Could they spend time with our cats without it turning into a big liability? What if someone was bitten or scratched? Would I lose the house if someone got hurt? How could I protect my cats and our visitors or was this just a stupid idea? I thought about it for a few minutes, realizing I had to take the chance. I needed to help my neighbors. It was worth the risk. That night Kitties for Kids was born. I've written more about our program (you can see the post HERE). 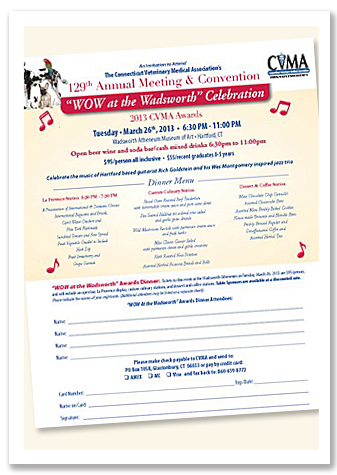 The invitation to the 2013 CVMA Awards. 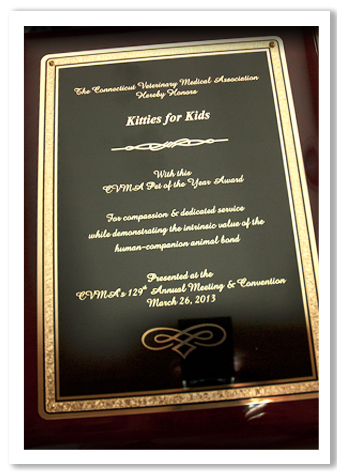 But what I've been keeping secret for a few months is that our program was chosen by the Connecticut Veterinary Medical Association to receive their Pet of the Year Award! This special award is given to honor our FOSTER KITTENS for their outstanding achievement in helping our town's kids find their smiles again. When I was first contacted about this award I thought it was a joke. I called my vet and Dr. Larry said he'd been part of CVMA for years and that CVMA has been around since 1884 and was a very distinguished organization. Wow. ©2013 Robin A.F. Olson. I was a bit sad that no one jumped into the fountain at the Awards Banquet, but there's always next year. On Tuesday, March 26th, Sam and I drove to Hartford, CT to the Wadsworth Atheneum to attend the Awards Banquet. Now any of you who have read this blog before, know that I've been the President & Founder of Kitten Associates, Inc. for almost three years. To be in a room FULL OF VETERINARIANS was a DREAM COME TRUE! I felt like a kid in a candy store! I wanted to run up to every Vet and make friends with each one. The heck with the award, I need to find more vets to work with (at a discount, of course!). ©2013 Robin A.F. Olson. 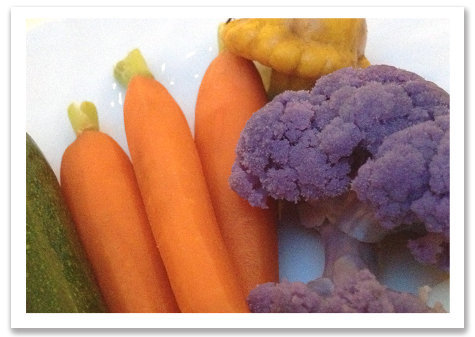 Yes, the cauliflower is naturally purple! Part of me worried that if I found a cute single Vet I might be tempted to leave Sam behind and run off, but the thrill of the evening and the upcoming award forced me to (sort of) temper my enthusiasm. The Wadsworth is a gorgeous Gothic Revival styled Art Museum. We couldn't explore the galleries, but were kept to a large courtyard with a lovely fountain in the center of it. 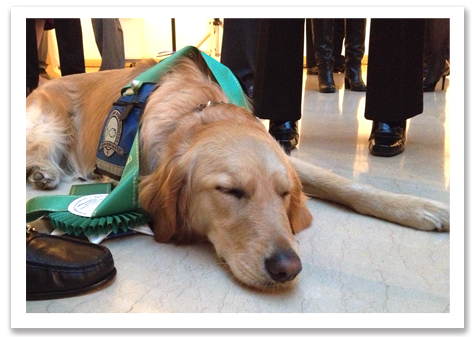 We hadn't taken more than a few steps into the room, when we were greeted by Dr. Chris, the former President of CVMA. He warmly welcomed us and thanked us for being such an inspiration to others. Who us? What? I couldn't believe it. ©2013 Robin A.F. Olson. This is Addie the Comfort Dog. She is clearly excited about winning her big green ribbon. Dr. Chris is an emergency room Vet. He likes the thrill of not knowing what's coming in the door next and works and sleeps at the hospital for four days in a row, then takes a few days off to be with his wife, two kids and their menagerie of animals he's taken from owners who could no longer provide care for their animals. This guy has a heart of GOLD and it was very clear he had a passion for caring for animals. ©2013 Robin A.F. Olson. Senator Blumenthal gives his acceptance speech. We also met with TD Bank sponsors, who were also gracious and friendly. They were chatting with our co-recipients from the Golden Retrievers of Lutheran Church Charities who had brought their dog, Addie with them. We sat down and chatted about, what else, dogs and cats. It was a pleasant start to the evening. ©2013 Robin A.F. Olson. 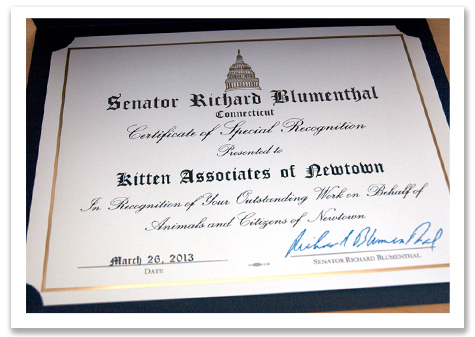 The cover of our Certficate from Senator Blumenthal. 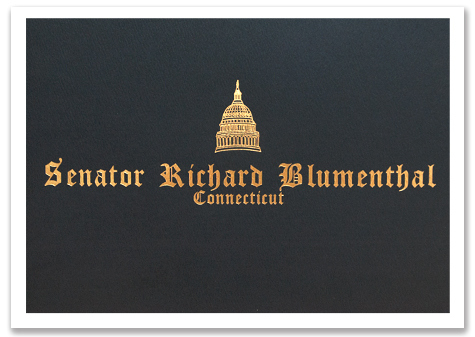 Chris came over and told us that Connecticut Senator Richard Blumenthal, who has been a hero of mine for years, was going to be attending the banquet and that in addition to his receiving an award, he had insisted on giving US a Certificate of Special Recognition for the work we do! I was stunned and thrilled. 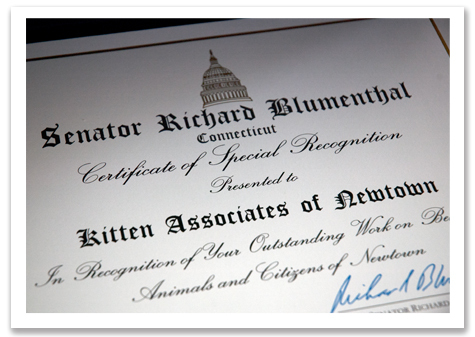 A certificate from our own Senator meant the world to me. This accolade was from our STATE, where I've lived most of my life. This sort of recognition was something I could have only dreamed of and here it was about to happen. ©2013 Robin A.F. Olson. My pride and joy. 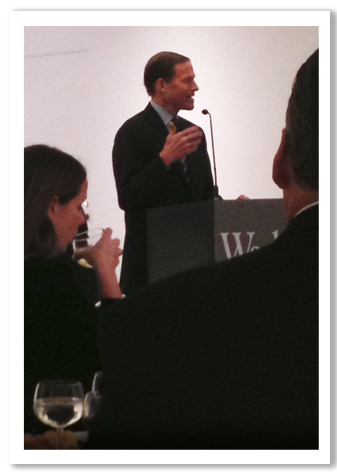 A few moments later, Senator Blumenthal entered the room. He gracefully made his way around the room, shaking hands and taking photos with people. I knew we would get to meet him so I tried to ready myself for the moment. He shook my hand and thanked us for our service to the people of Newtown. I quickly said a few fumbling words and before he could leave I gave him my card and I asked for a photo. I kept thinking, this man has been to the White House. He knows the President of the United States. Wow. ©2013 Robin A.F. Olson. Proof! 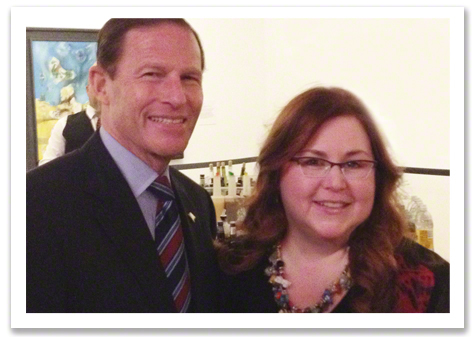 Senator Richard Blumenthal and Robin A.F. Olson (me!). Dr. Chris made the opening remarks and introduced Senator Blumenthal. The Senator gave a very moving, well articulated and heartfelt speech. He had no notes. I thought about how many speeches he must have given over the years and that it was probably second nature to him. I was glad I didn't have to give a speech that night because I doubted I could do as good a job-even with notes. ©2013 Robin A.F. Olson. A close up-I'm so honored! 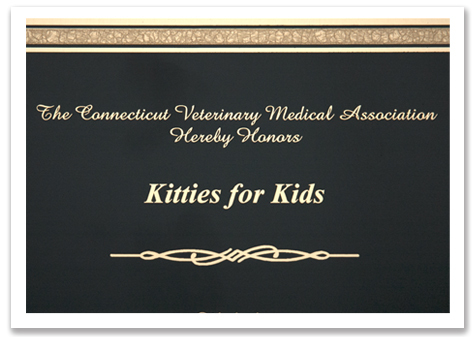 Dr. Chris returned to the podium and began to talk about Kitten Associates and our Kitties for Kids program. I'd sent CVMA information about us and thought I'd hear back what I'd written, but Chris had his own special commendation for us. Hearing it made me blush with joy. I couldn't get over that this was our moment in the spotlight. All we had to do was get up, walk across the room and accept our plaque and certificate. ©2013 Robin A.F. Olson. Our CVMA Pet of the Year Award. Chris handed me the awards and he whispered to me to go ahead and say a few words. WHAT?! Make a speech? NOW?! I had NOT prepared a single word, but I pulled myself together and I knocked one out of the park. Thank goodness I didn't flop in front of all those juicy Veterinarians! I was buzzing from all the adrenaline coursing through my veins. The rest of the ceremony flew by and no sooner than it was over, the Vet of the Year, Dr. Eva Ceranowicz of Bloomfield Animal Hospital, came over to introduce herself to us. Again, I was floored to get this sort of recognition when I was planning to introduce myself to her. ©2013 Robin A.F. Olson. We did it! She was delightful and charming. We had a quick, intense conversation, then she was off to talk to more guests and we followed suit. I got to talk shop with a few Vets who were clearly amused by my knowledge of all things de-wormer related. I tried to make quick BFFs for future reference, but most of the Vets I spoke with had their Practice too far away from Newtown. The evening was winding down and just as Sam and I were going to leave a gentleman introduced himself to us. He said his name was Gordon and turns out he's the Executive Director of the Connecticut Humane Society! As if talking with a room full of Veterinarians and meeting Senator Blumenthal wasn't enough, here was someone I admired from the rescue side of things and he's a GUY. A GUY WHO DOES RESCUE…(who is also adorable, but I didn't say that to his face). Wow again! ©2013 Robin A.F. Olson. 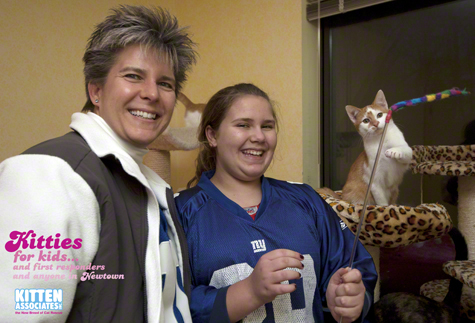 Wendy and Sam really had fun taking part in our Kitties for Kids program (with Barney in the background). We had a lively conversation and I hoped we would be in touch. He was glad to work with us and vice versa (in our small capacity). Of everything that happened that night, this was definitely a highlight. We shook hands (he has a nice, warm, strong handshake) and said goodnight. I walked out into the cold night air, floating on cloud nine. I never expected the night to go so well or to be so honored for our Kitties for Kids program, but I learned that if you follow your heart, it will take you in the right direction. And now if you'll excuse me, I have another family coming to visit our kitties and I need to get the room ready! Make sure you LIKE the CVMA Facebook page. It's embarrassing that they only have 141 likes! Also, make sure you visit the Connecticut Humane Society FB page and say hello from Robin, but don't tell them I have a crush on their boss. 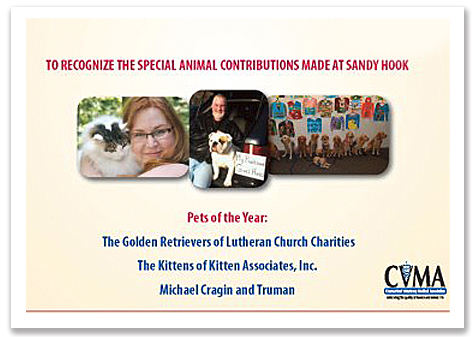 Read more about Kitties for Kids is a WINNER!